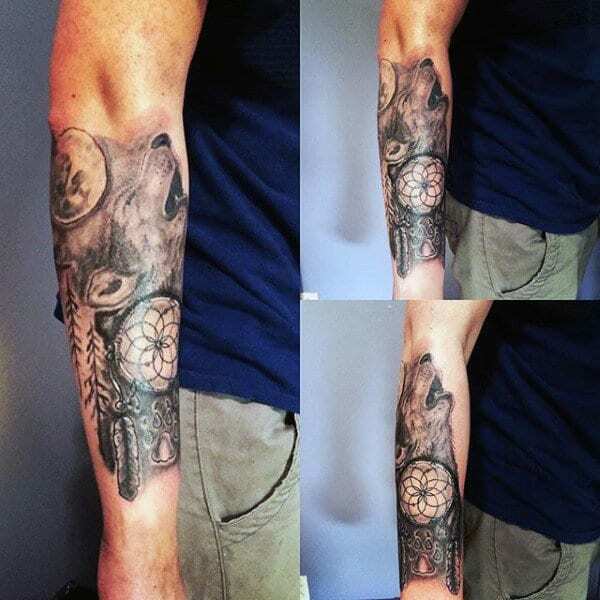 Getting a wolf tattoo is an obvious choice for those planning to have their first tattoo because of their familiarity. Wolves have long been an important symbol in many cultures around the globe; especially for native Americans and the Celts. Most of the time, people perceive wolves only as ferocious and ruthless predators, while for others, they’re positive symbols. Wolves hunt in packs and are efficient predators in that sense. They can also survive harsh environmental conditions which render them feared by many. Ancient Christians viewed wolves as a manifestation of Satan because of their scary reputation back in the days. 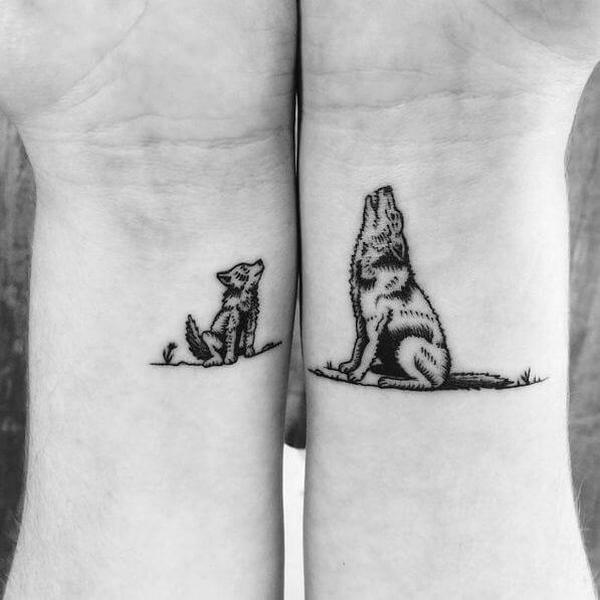 Because wolves no longer get to interact with humans as much as before, people started to see their positive attributes strengthening their status as noble and respectable beasts. 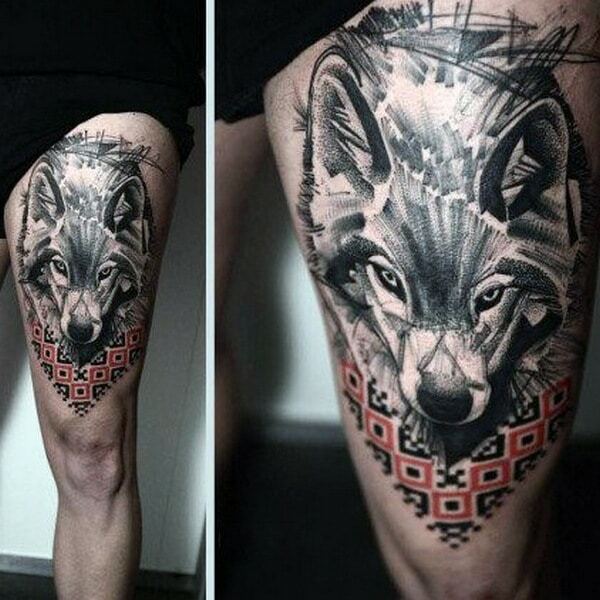 Today, people generally see wolves as a symbol of intelligence and strength which inspired them to get a wolf tattoo. 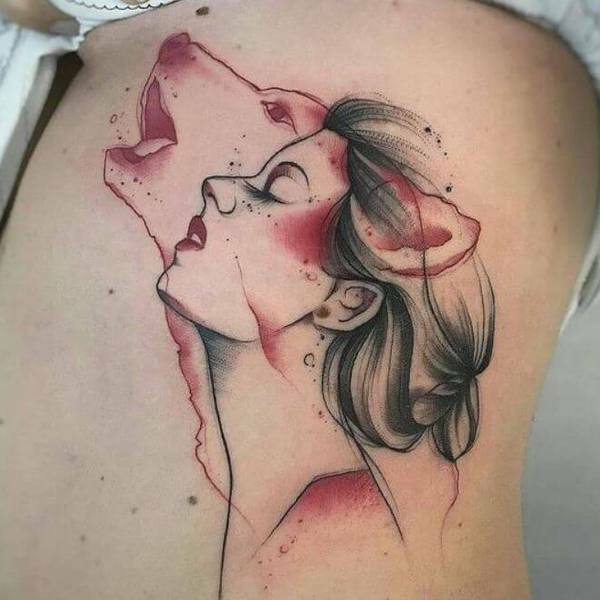 Getting a wolf tattoo is an excellent choice for those wanting to boost their confidence and look great at the same time. 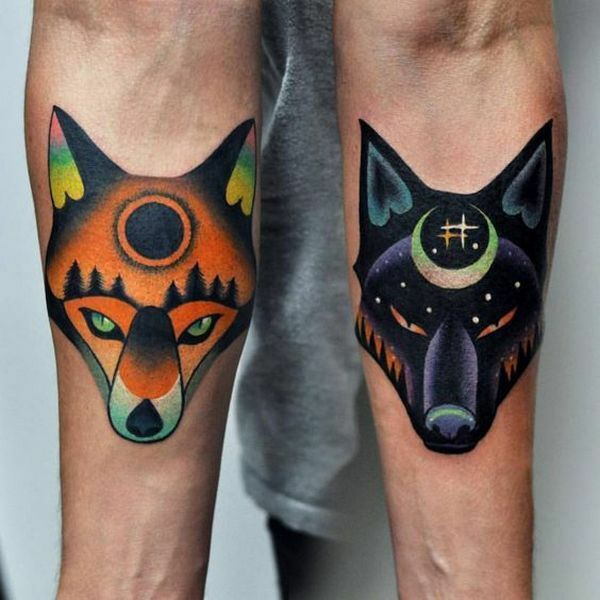 Get inspired by these striking wolf tattoo designs and enjoy the benefits of having one! 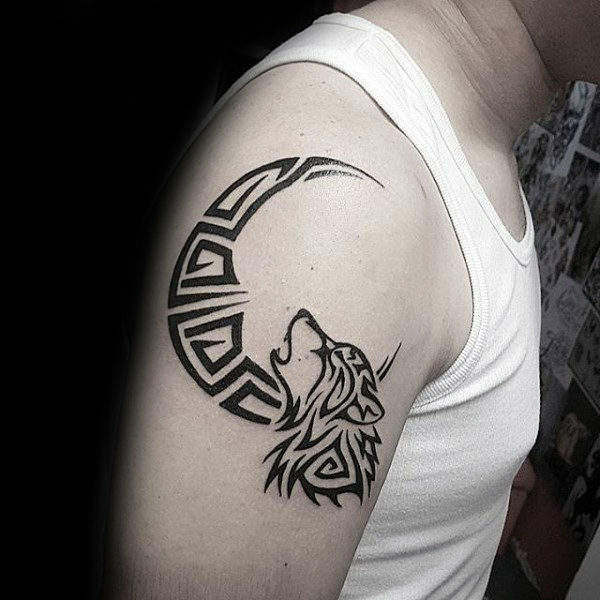 Tribal designs are famous for their familiarity and striking appeal to virtually anyone. 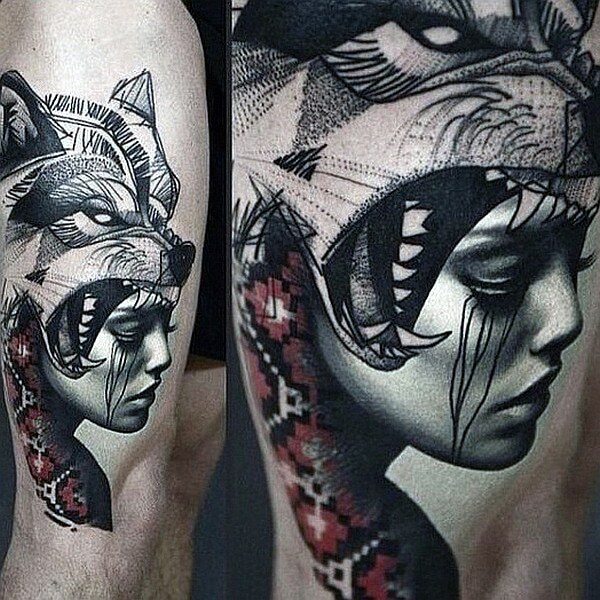 You too can rock a tribal tattoo by planning it well, and above all, embedding it with a deep meaning! Signifying the tattooee’s solemn temperament, the deep-red moon behind the wolf likewise supplements seriousness to the design. 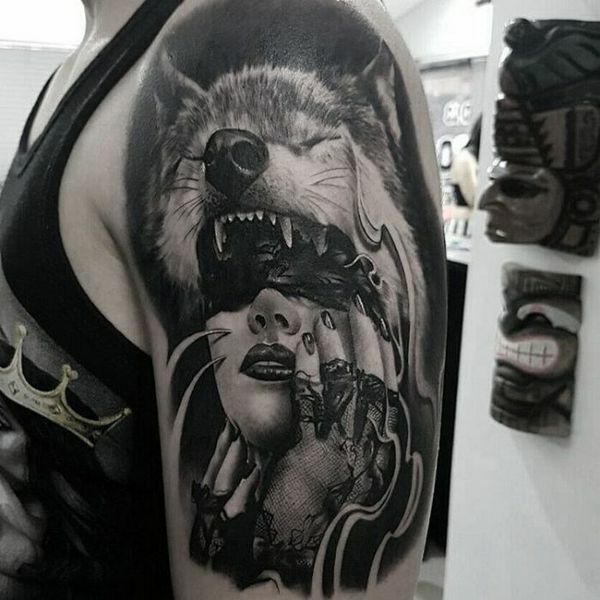 Get a unique and mysterious look by incorporating a traditional design together with a roguish expression. 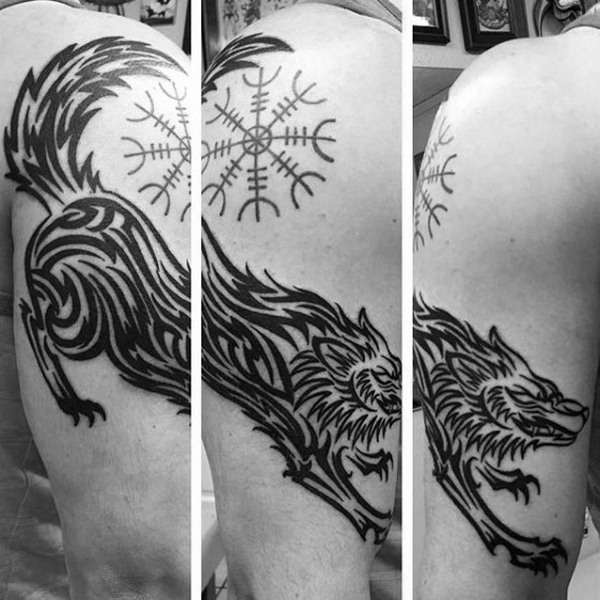 The striking appeal of the wolf is due to its beautiful moon design. 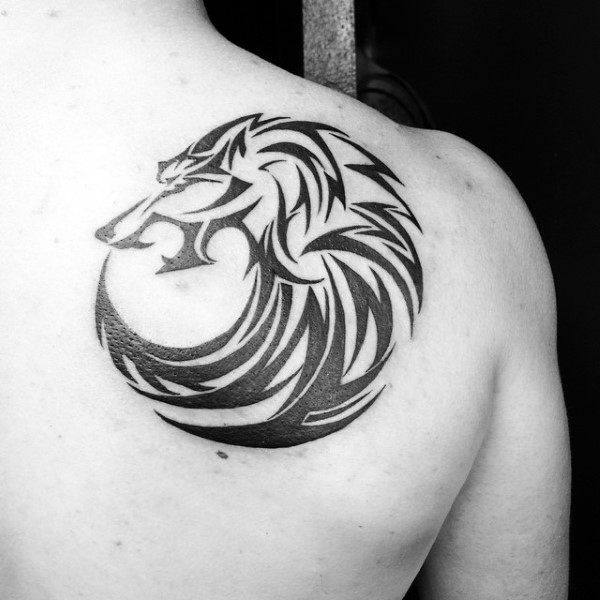 You can also add a deeper meaning to your wolf tattoo by giving it an emblem-like appearance. 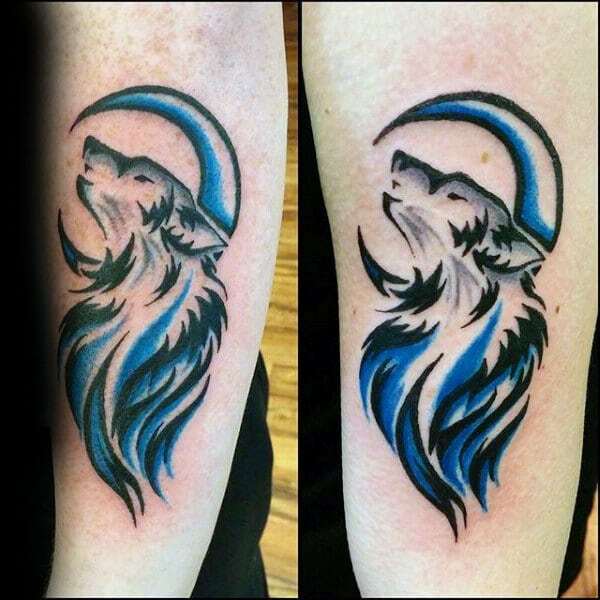 Sophisticatedly etched onto the skin, its beautiful blue color indeed adds more flavor to the design. The blood-red color of the mark significantly adds up to its striking look. 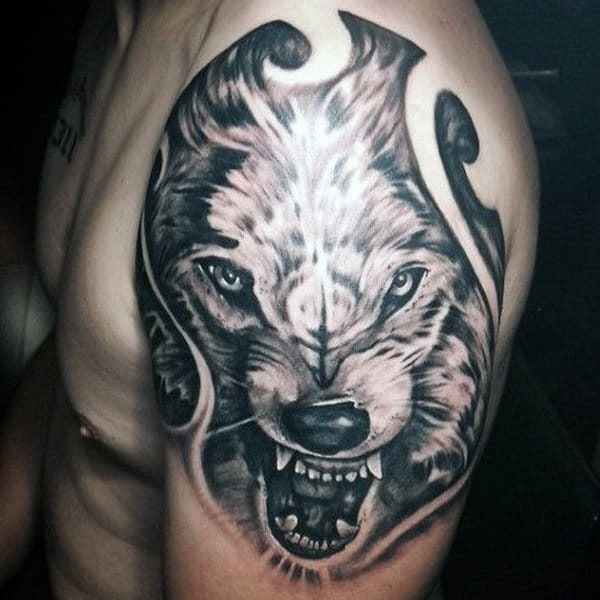 The angry stance of wolf head represents the hidden rage of the tattooee well. 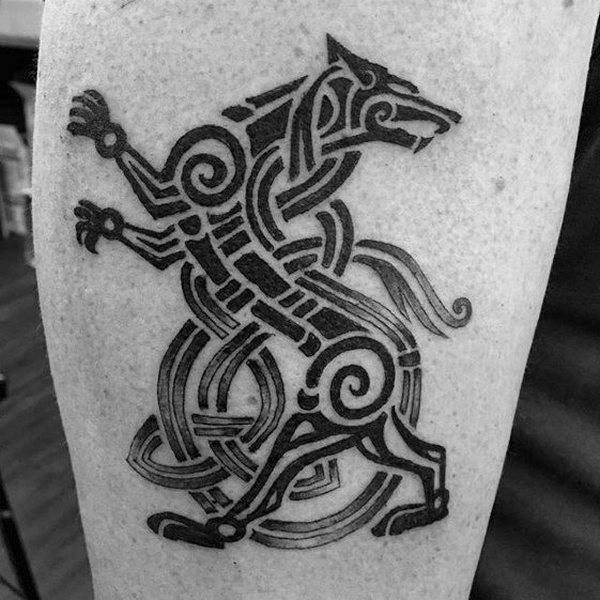 The unique attribute of this wolf tattoo is well-supplemented thanks to its ethnic moon design. 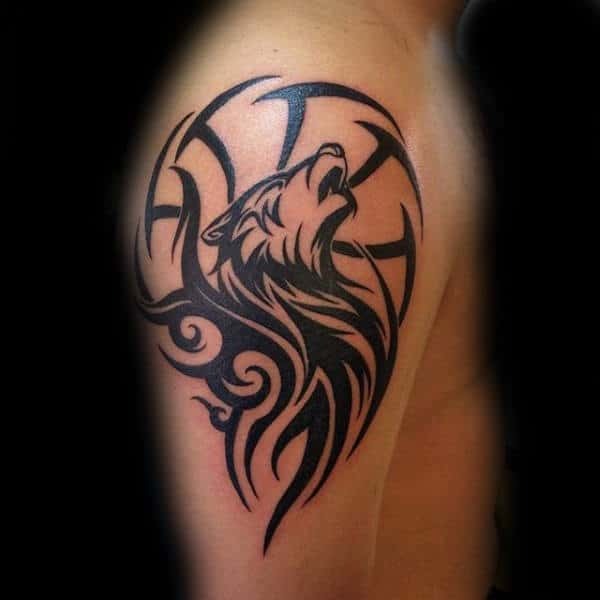 Its climbing wolf design represents the person’s courage and passion towards success. 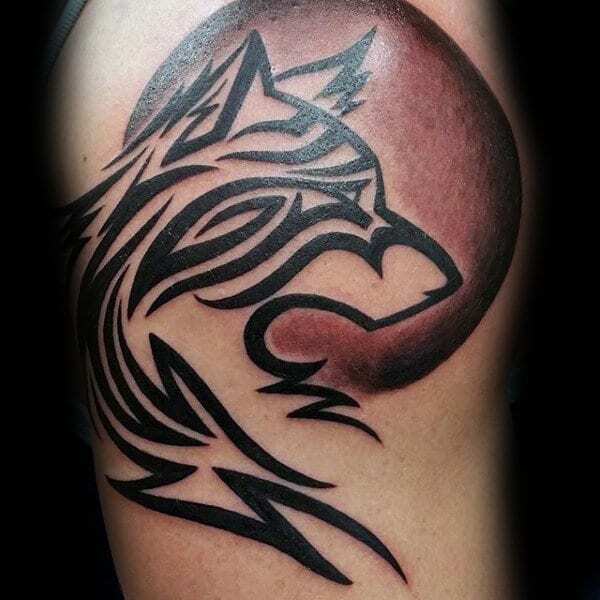 The blood moon enhances the visual impact of the howling wolf which adds both value and meaning to the tattoo. Sometimes referred to as sacred hoops, dreamcatchers are used to protect people on their sleep. 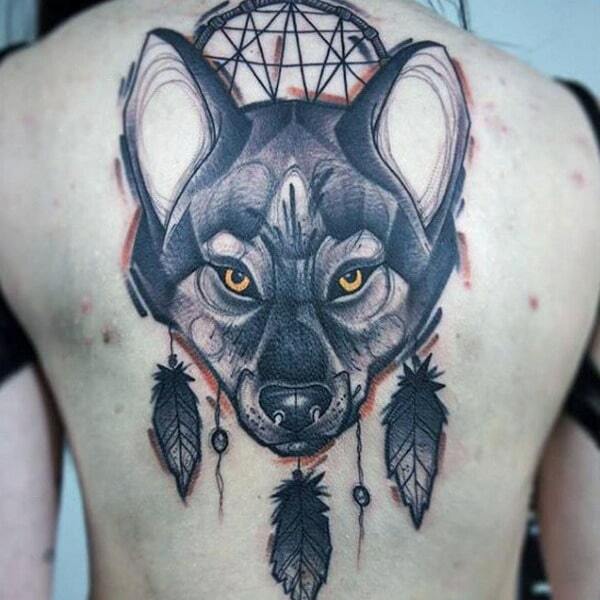 Combining dreamcatchers with wolves in a tattoo certainly give the designs a more profound meaning. 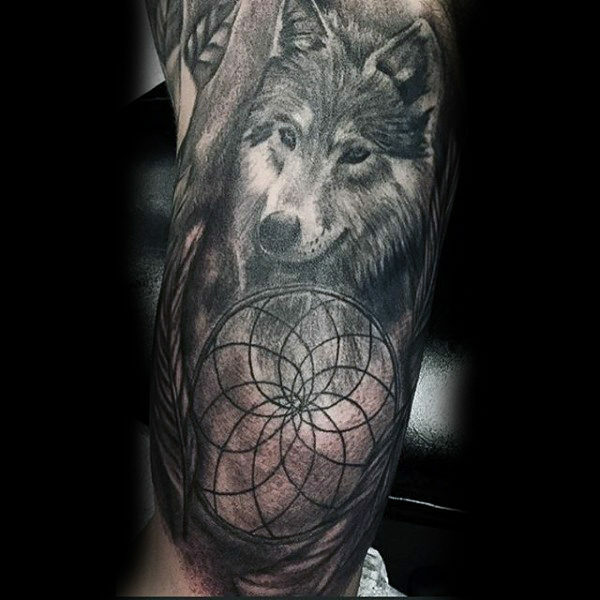 Aside from the benefits of having an appealing look, wolf dreamcatcher tattoos can also be used to pay tribute to Native Americans since they were both valuable symbols in their culture. 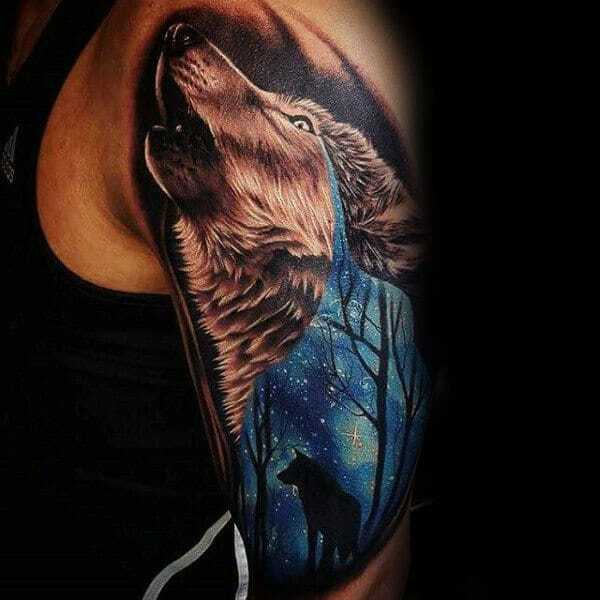 The dreamy blue mist alongside the howling wolf sends chills to anyone who sees it since it depicts the abstract thinking of the tattooee. 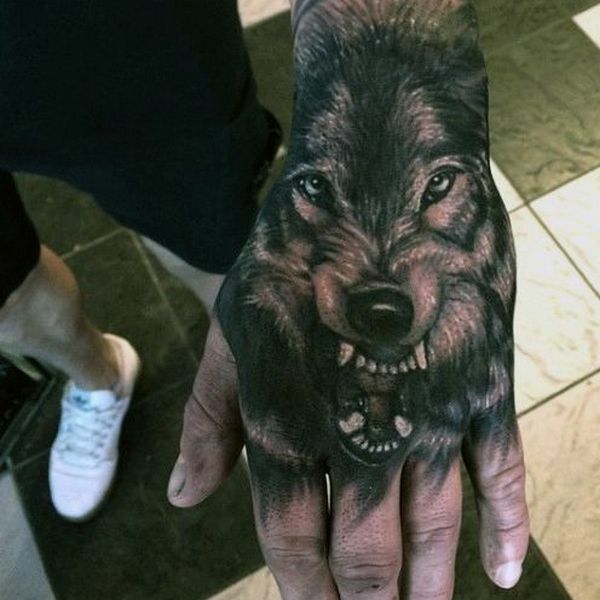 Do not undervalue cartoonish tattoos since they can hold profound meanings while retaining its striking appeal. 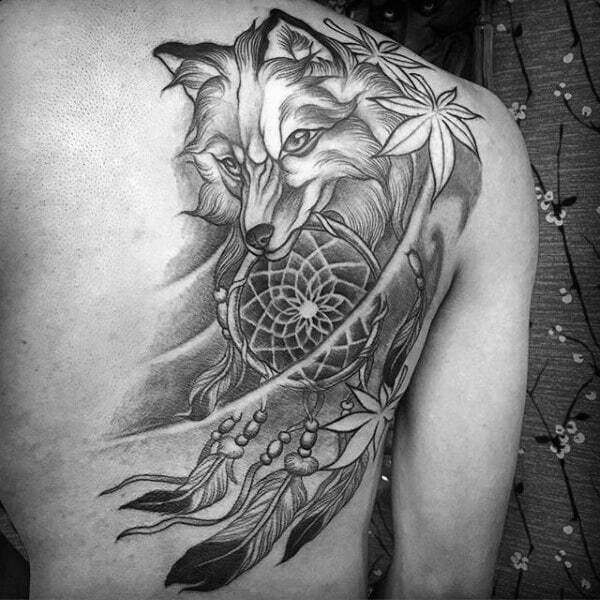 The sketched form of the wolf certainly complements well with the dreamcatcher that represents the tattooee’s love for his ancestors. 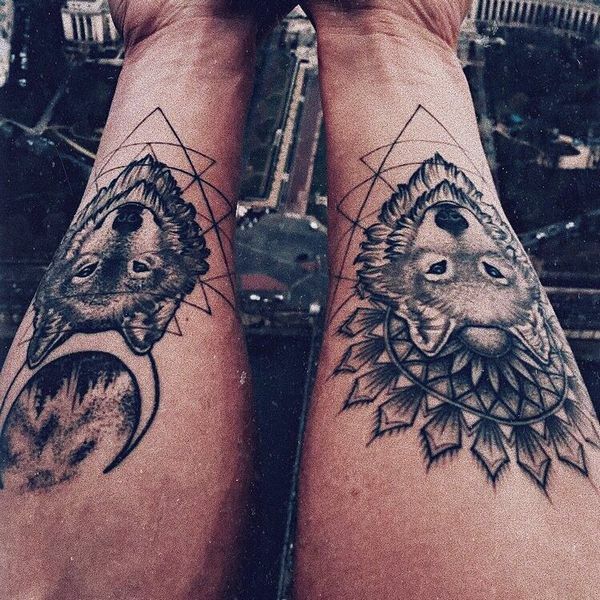 As seen from above, the wolf holds two different eye colors representing the tattooee’s exoticness. 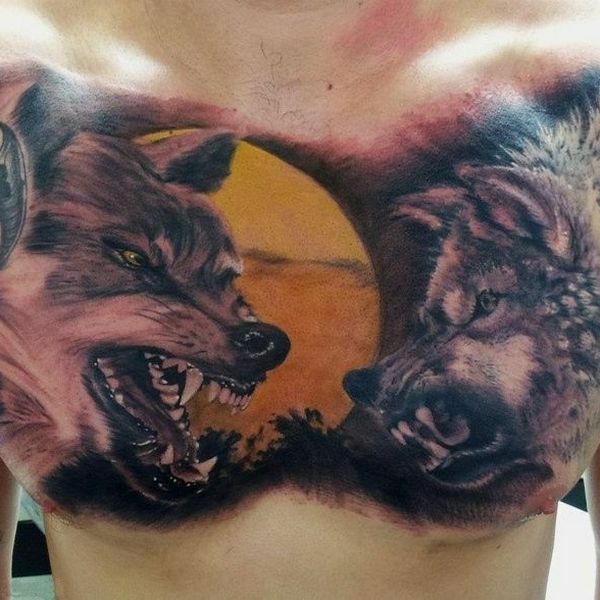 This tattoo plainly shows the heavy side of its owner. 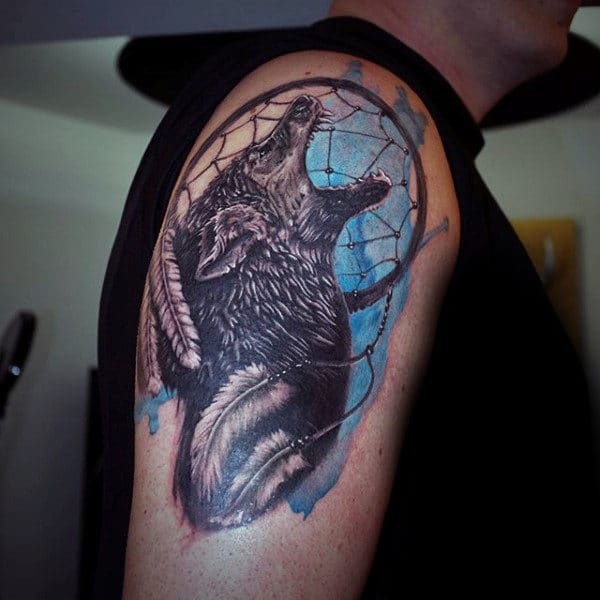 In this example, the wolf protects its owner’s dream by ultimately blocking evil spirits. 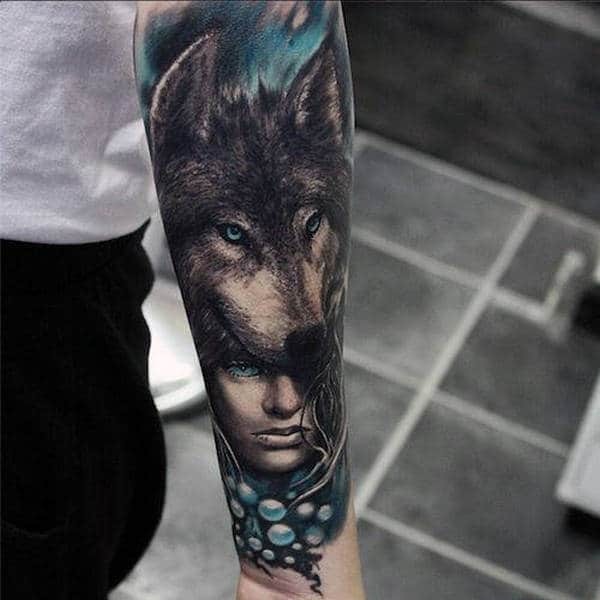 Symbolizing the owner’s quest for security, this tattoo balances out his insecurity because of the wolf’s rage and desire to protect him. 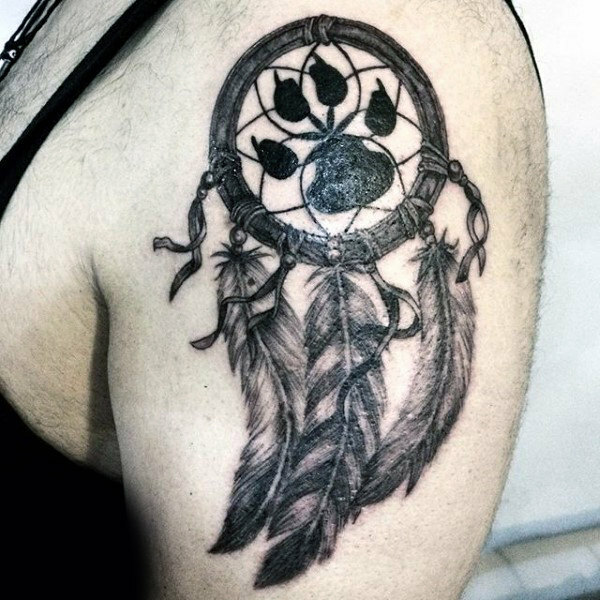 The wolf paw inside the dreamcatcher sends a signal to evil entities that it’s protecting his territory. 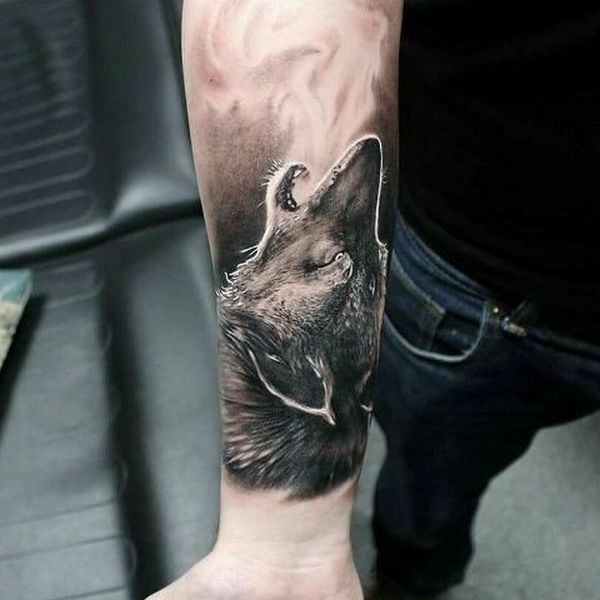 The wolf howling towards the moon expresses the passion and sincerity of its owner towards love and ambition. 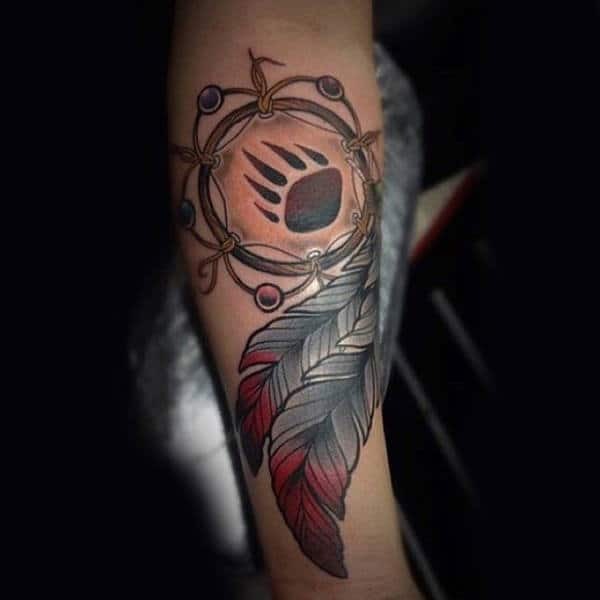 Express your desire to move forward by getting inspired by this wolf paw tattoo which also represents native Americans traditions. 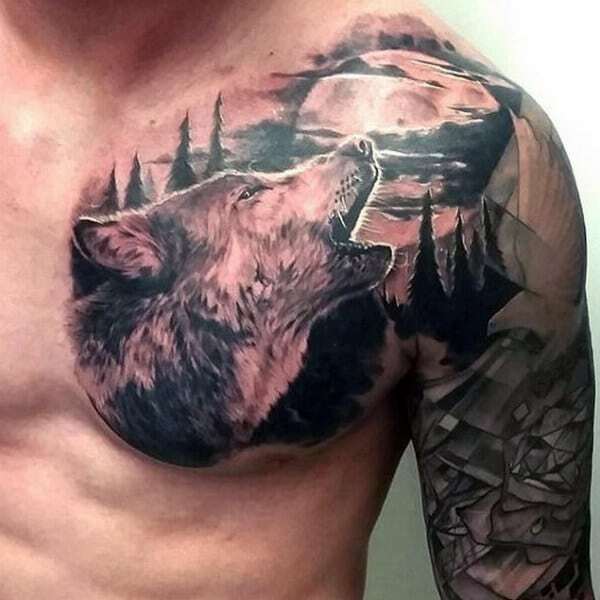 We’ve gathered the best wolf tattoos for men so you can indulge yourself in these beautiful pieces of art until you finally decide which design to ink on you. 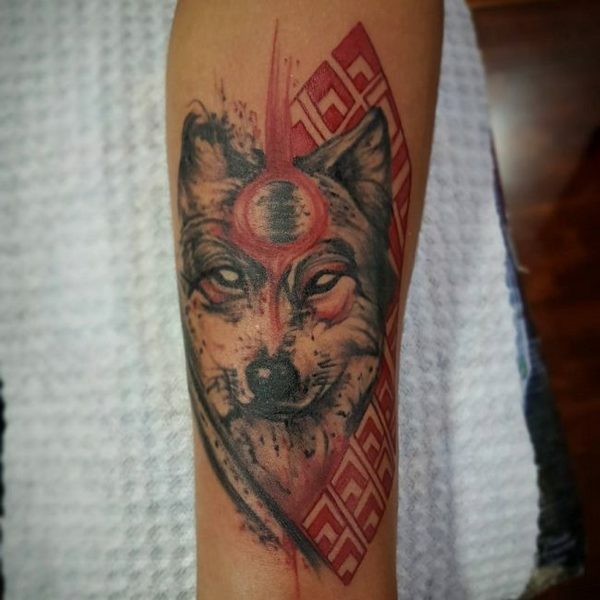 Get inspired with this unique glancing wolf design which symbolizes the patience and quiet ambition of the tattooee. 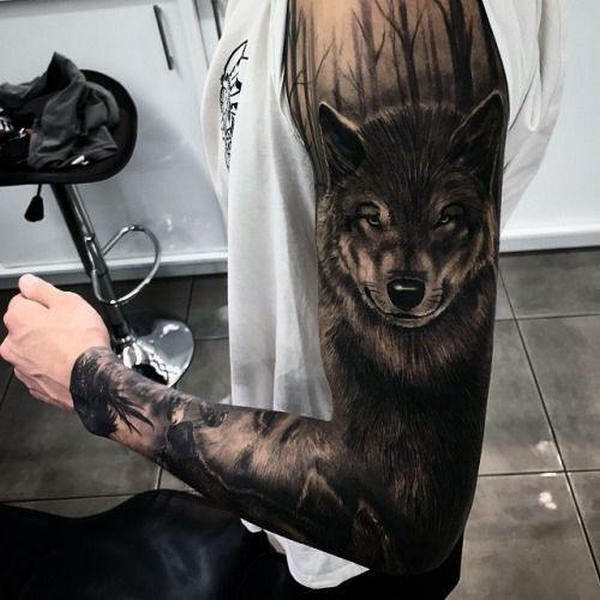 Getting a sleeve tattoo instantly uplifts your manliness, and by inking in a realistic wolf, your message is sure to be seen by others. Show off your modern gentleman’s taste by incorporating a crystal design which symbolizes a positive flow of energy. 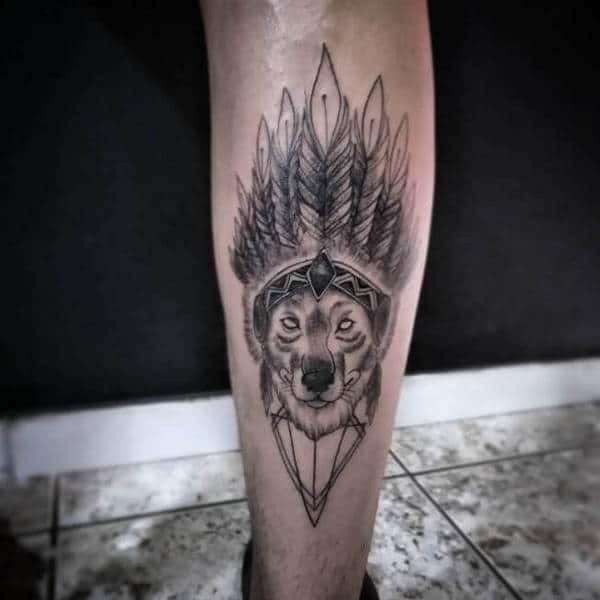 You can also get an intimidating appearance by getting a fierce and fearless animal indeed made for those who can back it up with a firm stance. 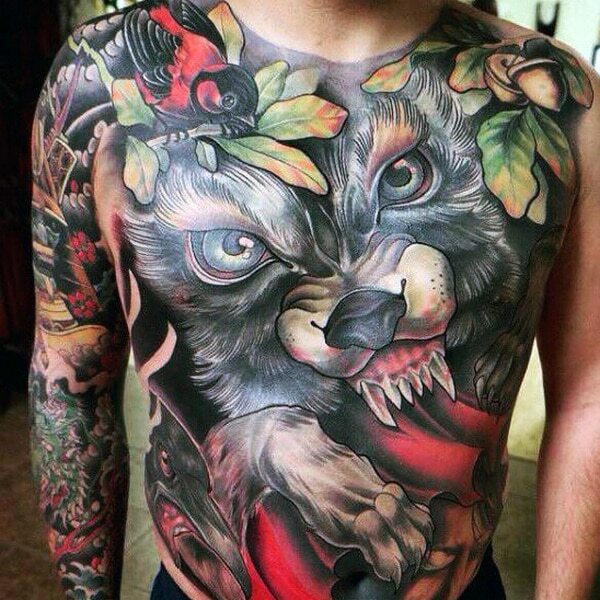 Getting a full front tattoo is a perfect choice for bold men because of its tendency to be a show-stealer. Choose this type if you are someone who wants to get noticed in every beach party. 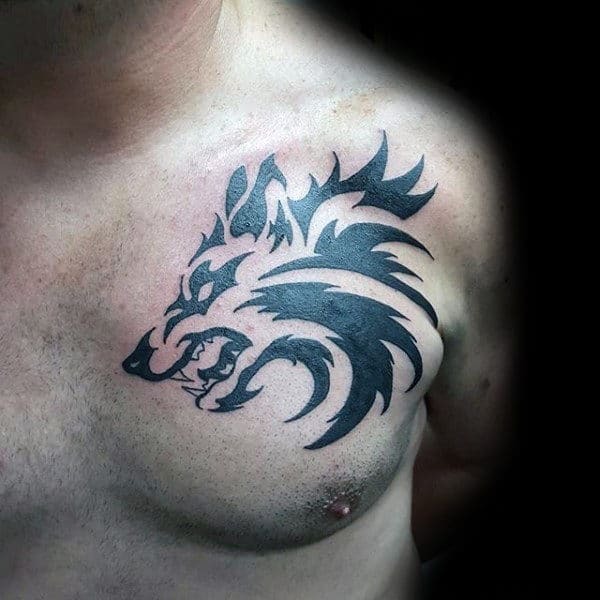 The howling wolf and full moon tattoo indeed complete your masculinity with its display of passion and commitment. 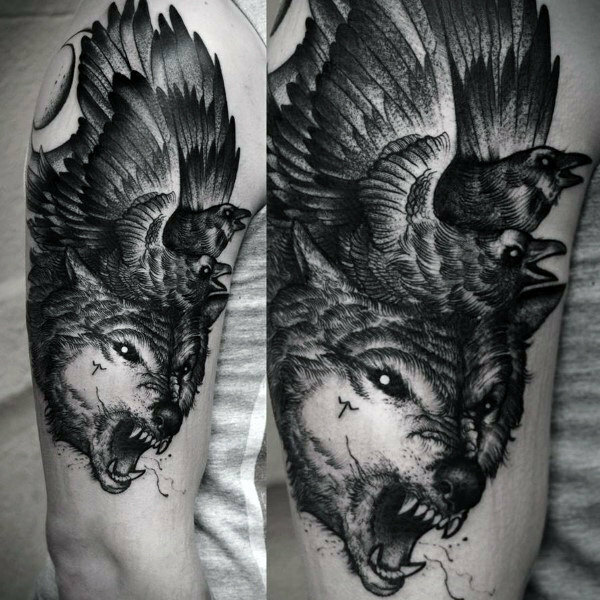 The young eagles represent the powers of the tattooee’s desire to grow despite the furious wolf’s representation of his agonies. 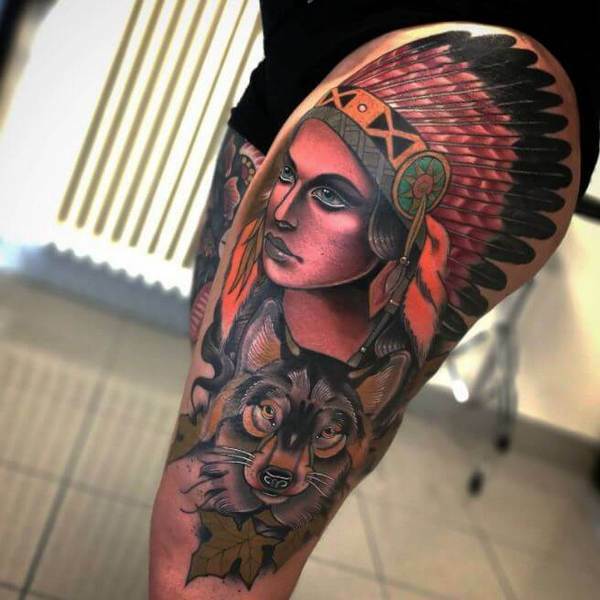 Show your taste for fine arts by getting a sophisticated design and placing it in front of your thighs so it can easily be seen. 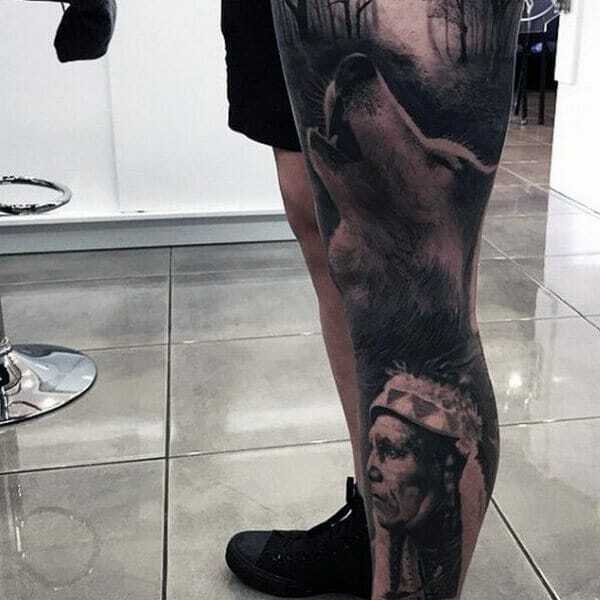 Are you an avid hunter or just a fan of unique tribal tattoos? 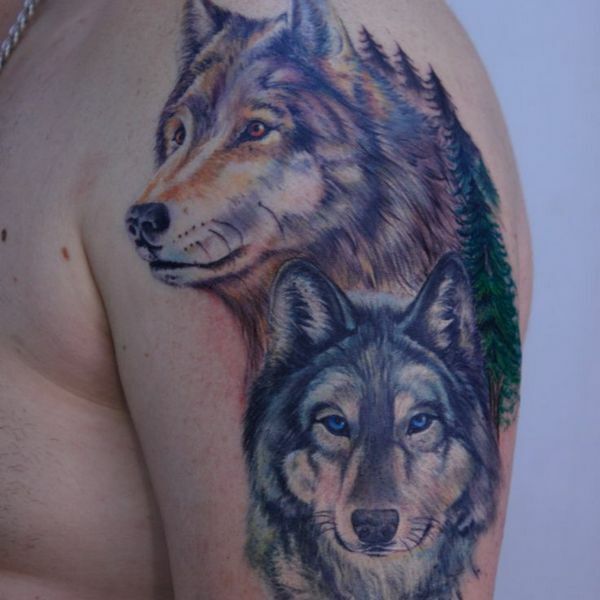 If yes, then getting a wolf tattoo ready to pounce on its prey is indeed a no-brainer. This tormented wolf head displays his firm stance to overcome challenges despite the factors trying to pull him down. 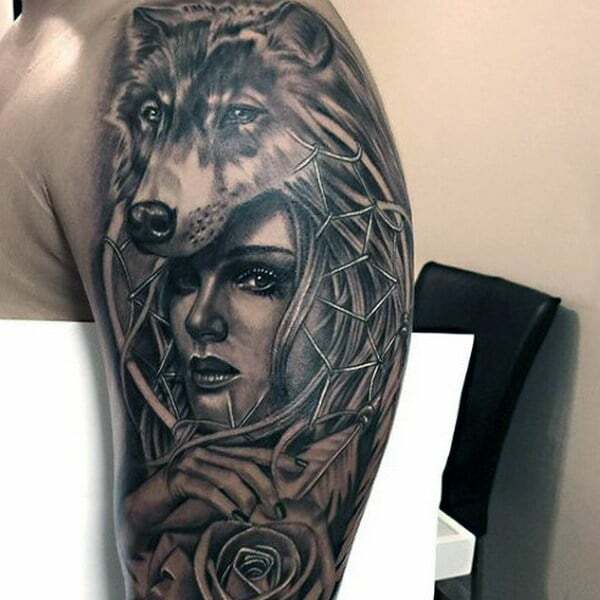 Although wolf tattoos are generally regarded as a man’s tattoo because of its fearless and savage attributes, they are also known for their loving and mysterious characteristics which attracted the attention of many females. 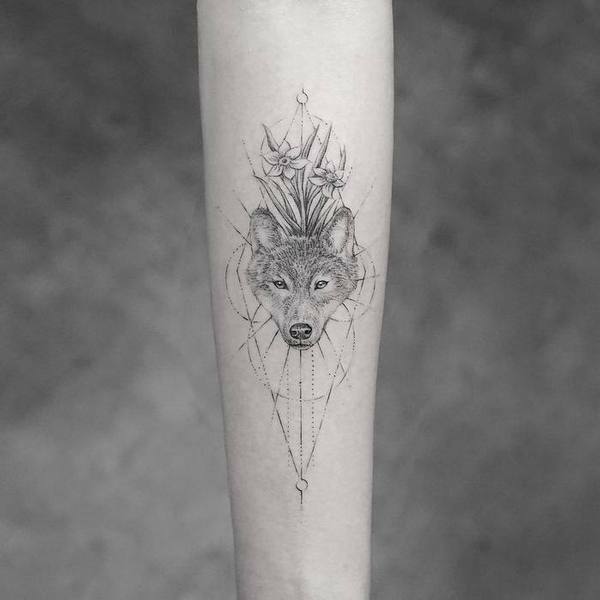 The wolf spirit is used here as a symbolism of the tattooee’s solemn yet passionate side which is an excellent first tattoo for women. 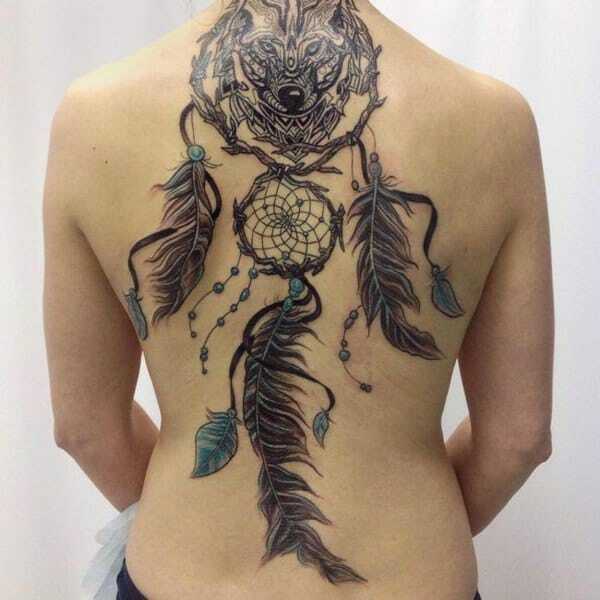 This fullback wolf and dreamcatcher tattoo is undoubtedly an excellent choice for those who want to show off some boldness. 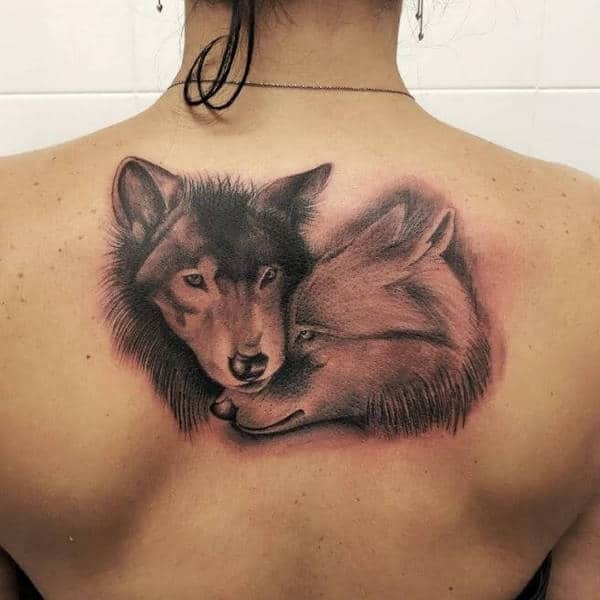 Display your passion for love and sensuality by inking a wolf couple on your back additionally giving it more visibility. 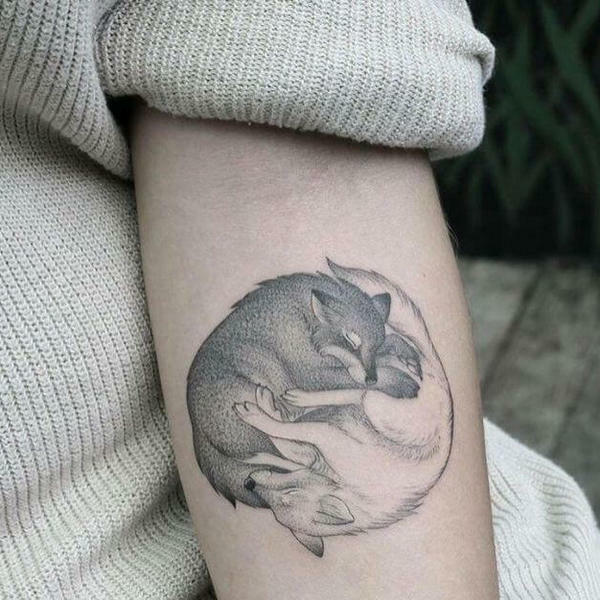 Impress every person you meet by getting inspiration from this ash and mist wolf tattoo which symbolizes the tattooee’s beautiful taste in art. 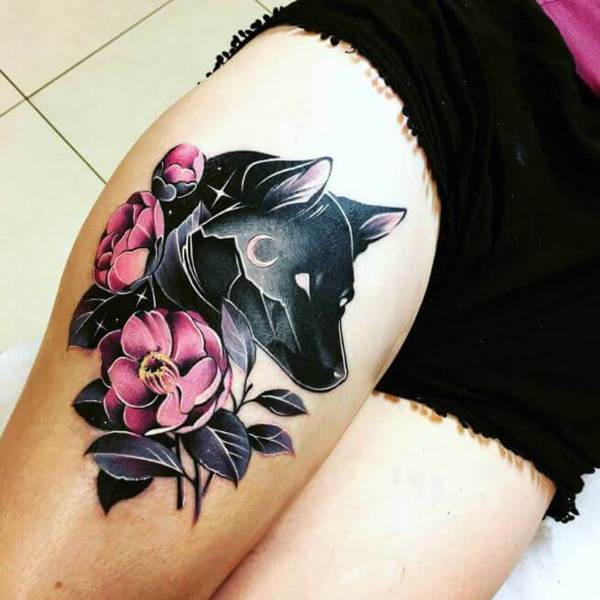 Exuding a black wolf and lovely rose, this tattoo is definitely for those who want to experiment and be liberal on their tattoo design. Show your ferociousness off to everyone and instantly fend off those who can’t handle your strength! 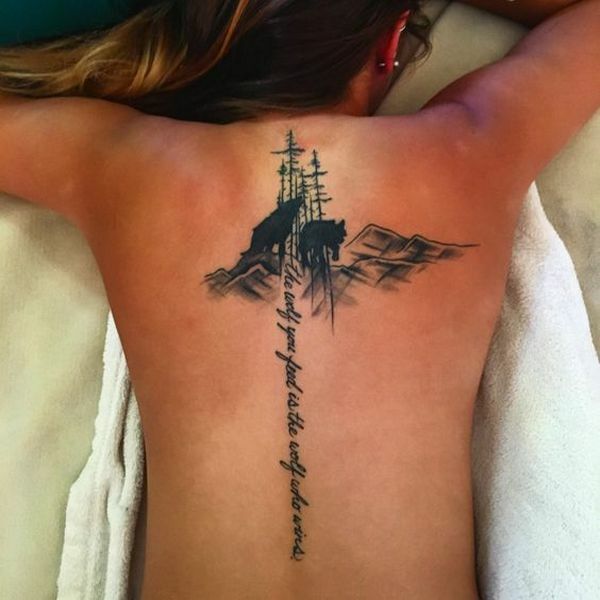 You can try and add other quotes that inspire you to a wolf tattoo letting its message get across more easily. 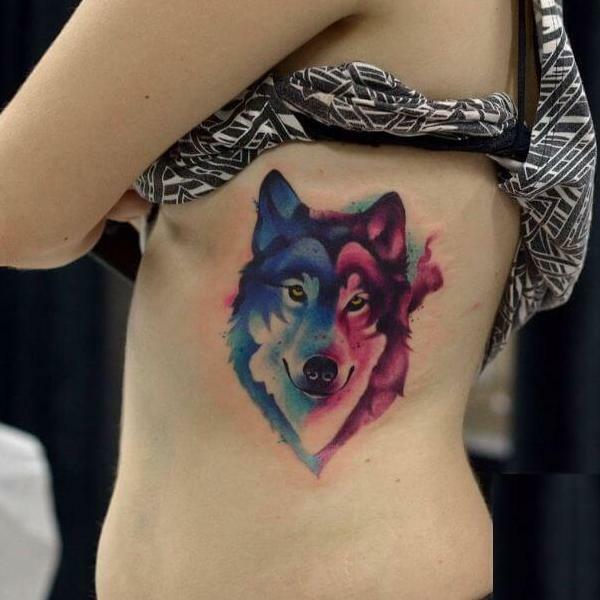 This wolf head design is the one to get by those with a taste of modern yet artistic designs because of its rare and colorful abstract design. Capture the attention of every person on the beach by placing an artistic tattoo under your rib which is sure to enhance your confidence. 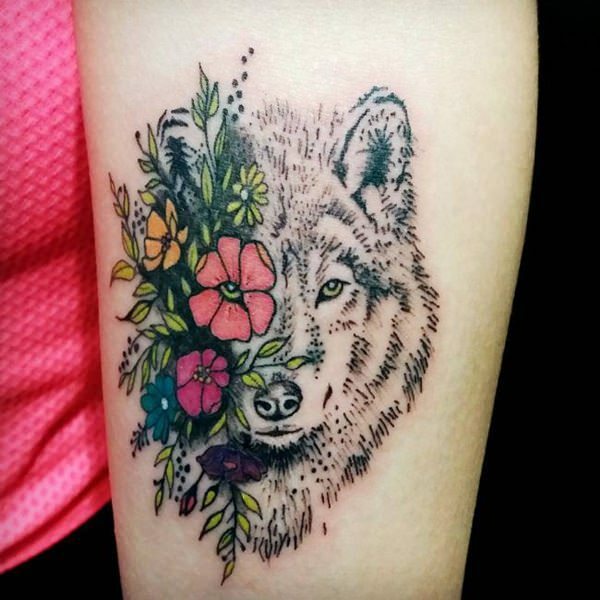 This depiction of a wolf head with flowers represents the tattooee’s creative and alluring taste. 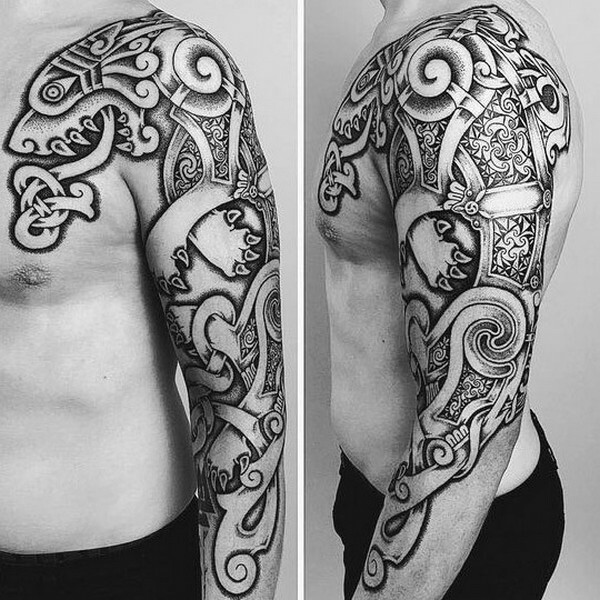 Directly influenced by Celtic culture, these charming designs are the best choice for those who want to stand out because of its subtle familiarity and emotional appeal. They were represented as guardians of nature and protector of ancient realms due to their calm yet dangerous temperament. 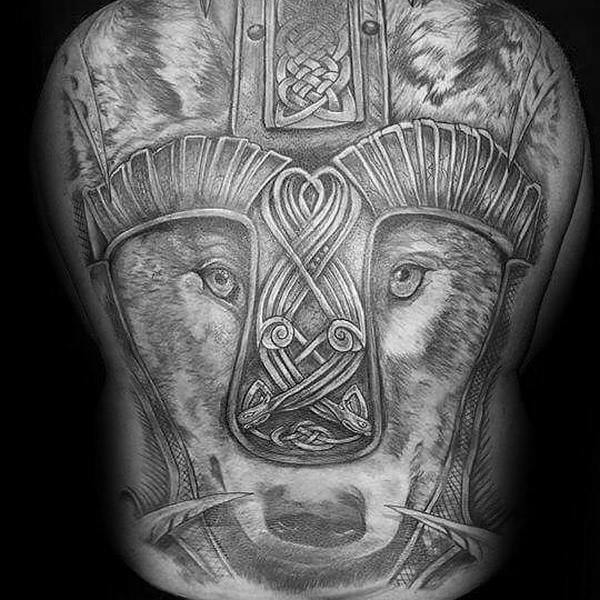 The wolf wearing a Celtic helmet signifies the wolf’s power while its quiet look represents its wisdom. 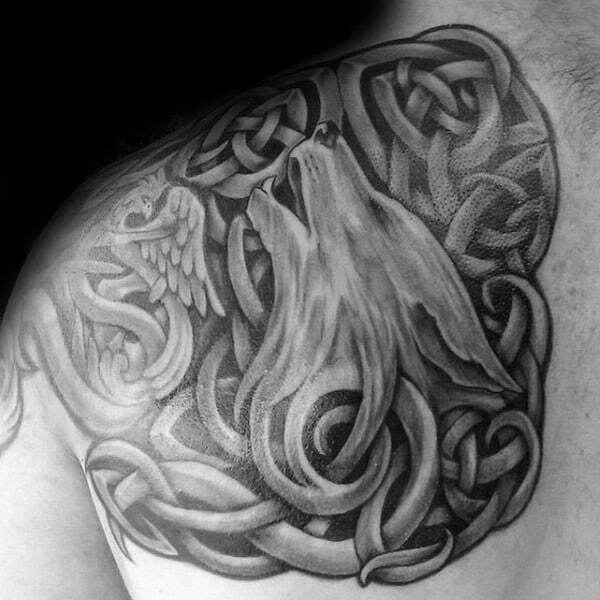 This tattoo’s magnificent display of power is indeed a testament to the wolf and eagle’s influence on the Celts. 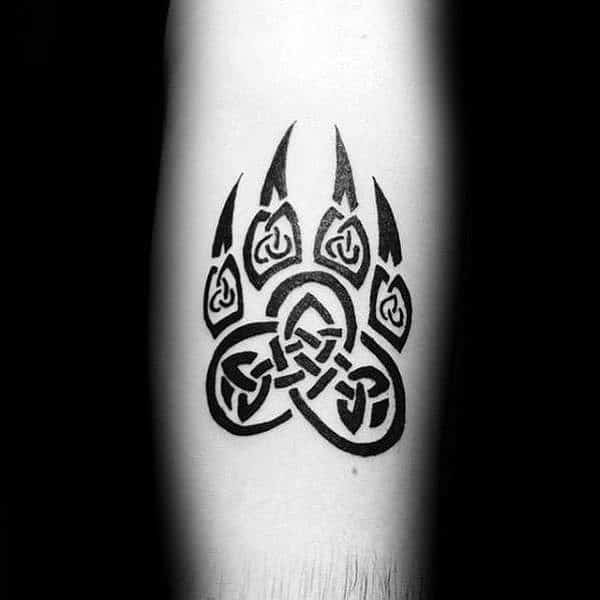 This wolf paw design certainly adds a layer of intensity with its ancient Celtic influence. 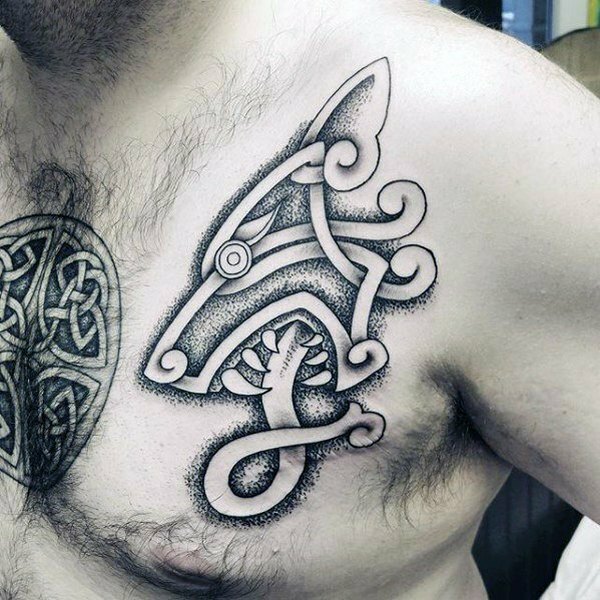 Present the message you want to convey better by putting words along with a Celtic wolf which enhances the overall impact of the wolf tattoo. 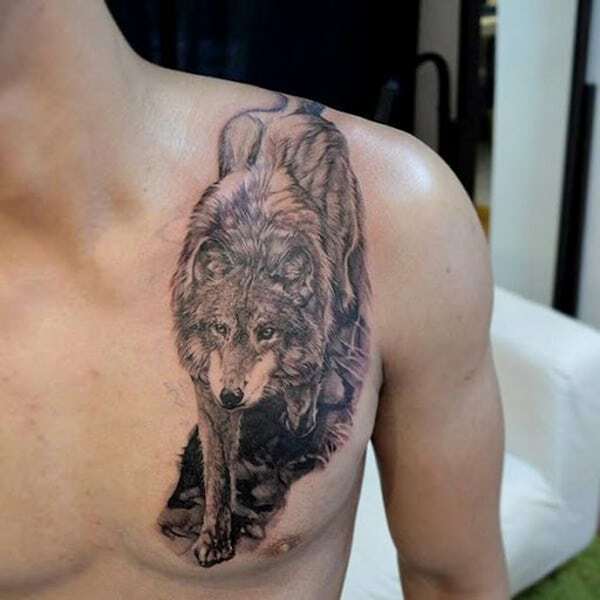 A running wolf represents its owner’s free-spirited nature which you can further add value by placing it on a visible body part. 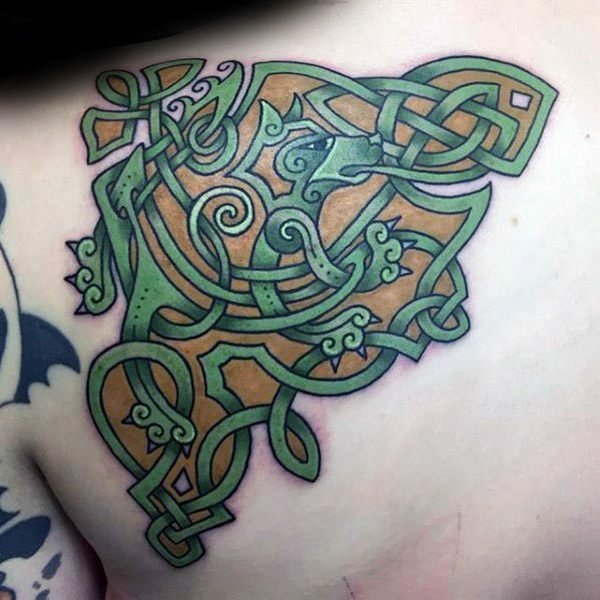 This tattoo sends us to another dimension with its retro futuristic-Celtic design. 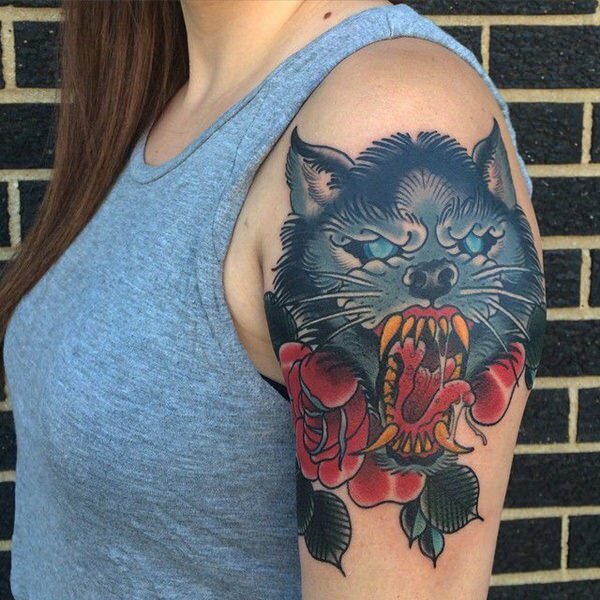 The wolf’s icy stare and ghoulish tongue indeed set it apart from traditional wolf tattoo designs. 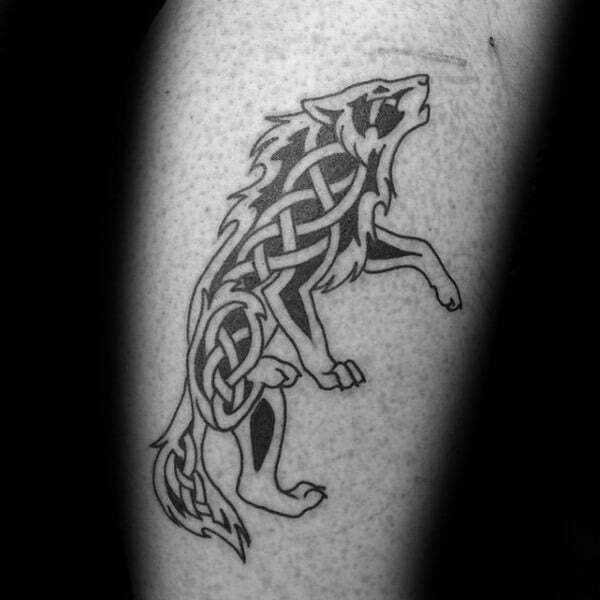 Add a unique taste to your Celtic wolf tattoo by incorporating a bold idea to give it a stronger fashion statement. 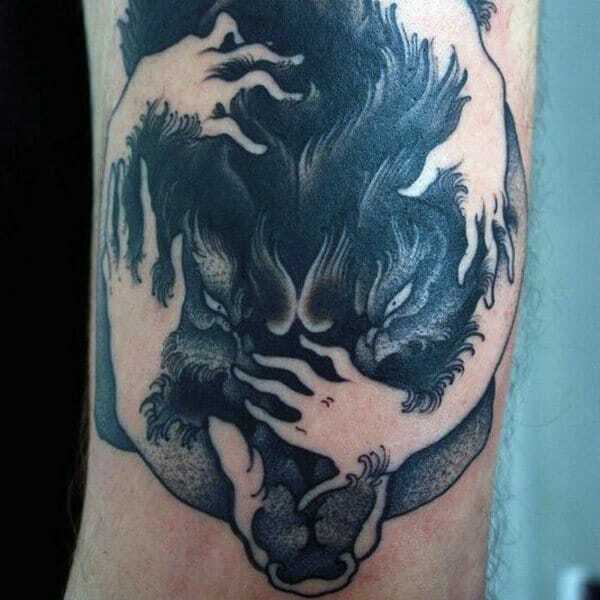 This is yet another ghoulish wolf tattoo further intensified by its easily-seen sleeve design. 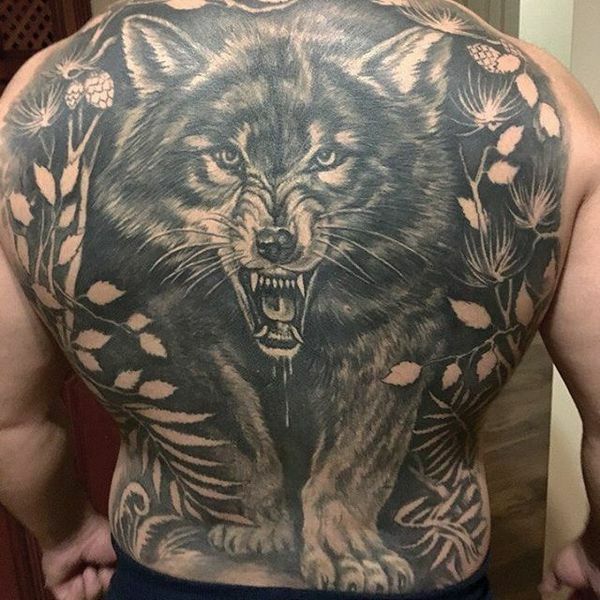 Unlike most wolf tattoos, this example is unique due to its standing wolf design. 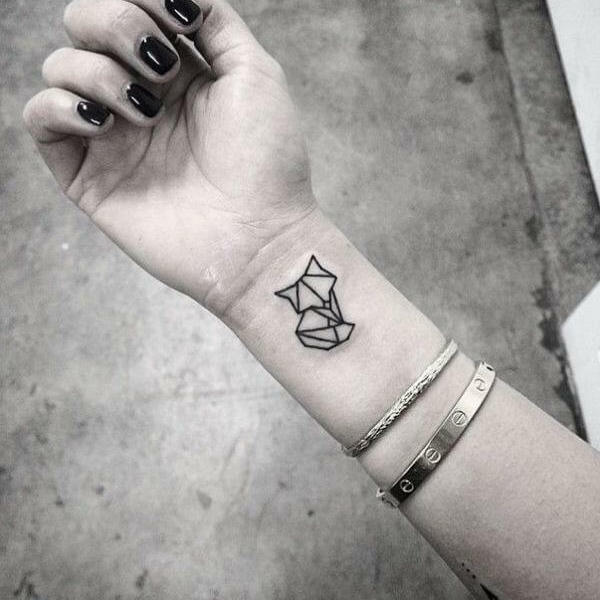 If you are a bit shy about showing your tattoo, then getting a small tattoo is an option you can consider. Not only that it looks cute, but its tiny size also adds up to its intimacy. 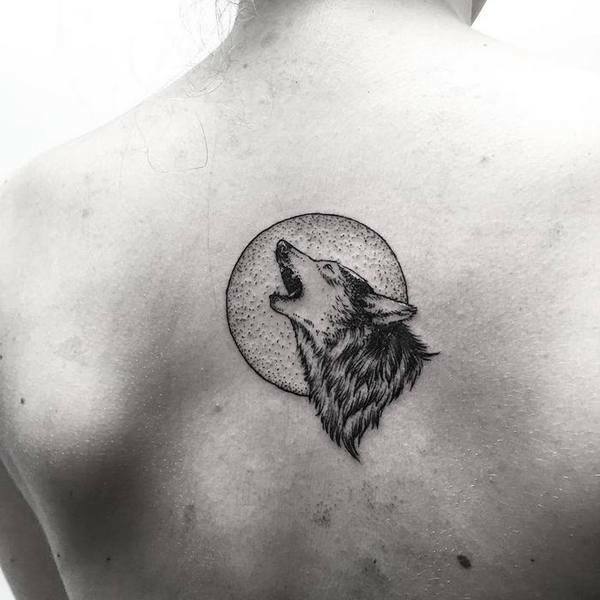 The small size of the wolf tattoo is not enough to undermine the superiority the howling wolf presents which are ideal for women who want a classy design. 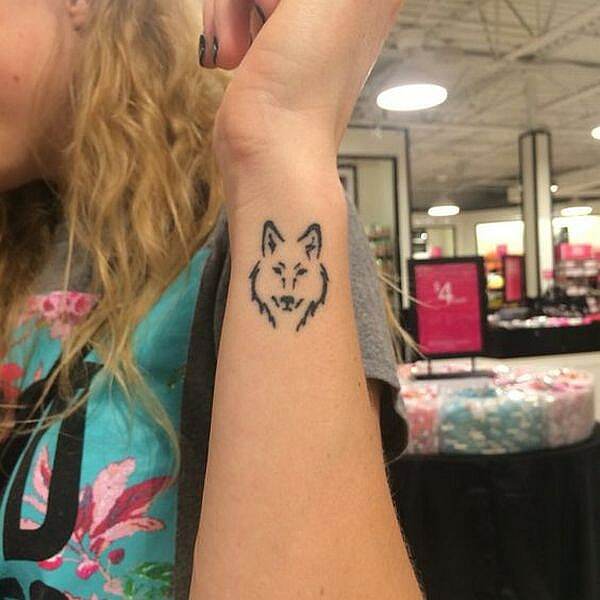 This cute wolf tattoo is further made attractive with its minimalist design. 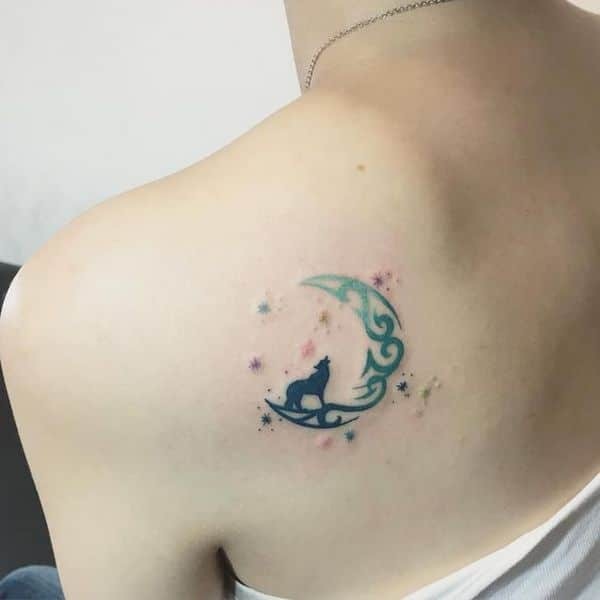 Overflow with confidence as you steal other people’s glance at your next party with this design in which the wolf howls while riding the moon in the sky. 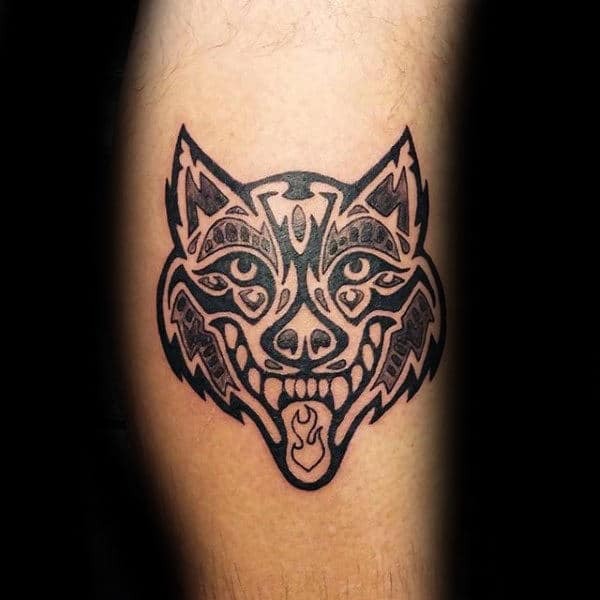 This small wolf head tattoo is an excellent choice for the younger generation because of its modern-looking geometric patterns. 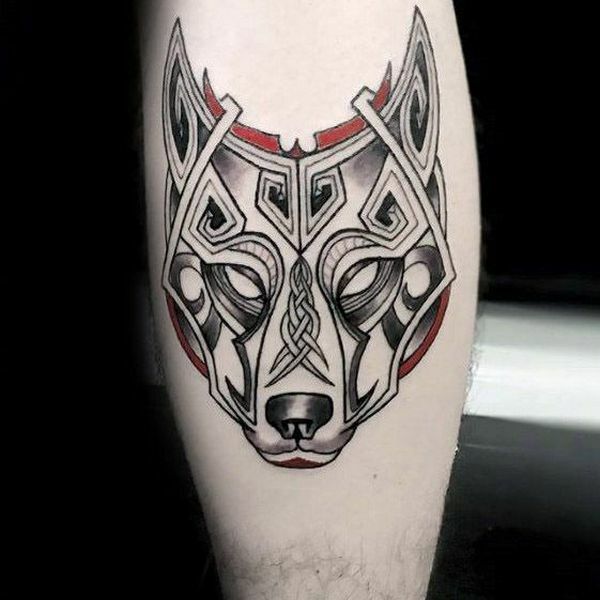 This small wolf tattoo is a bit hard to accomplish because of its finely-detailed design. 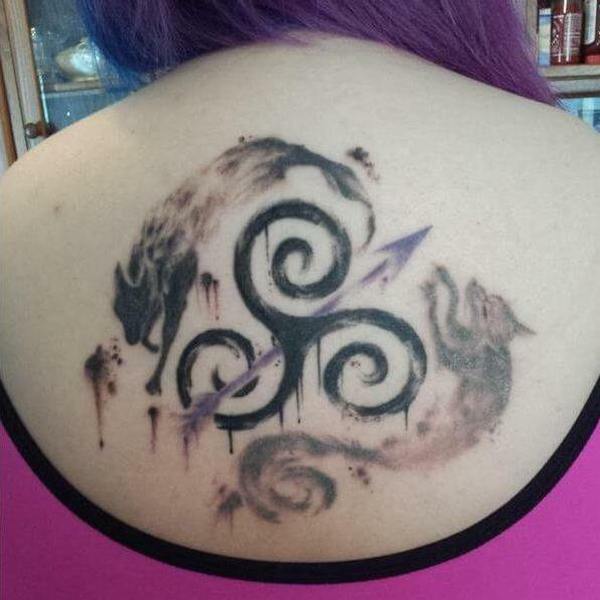 But getting a tattoo like this will eventually pay-off since it is sure to amaze other people when they see it. 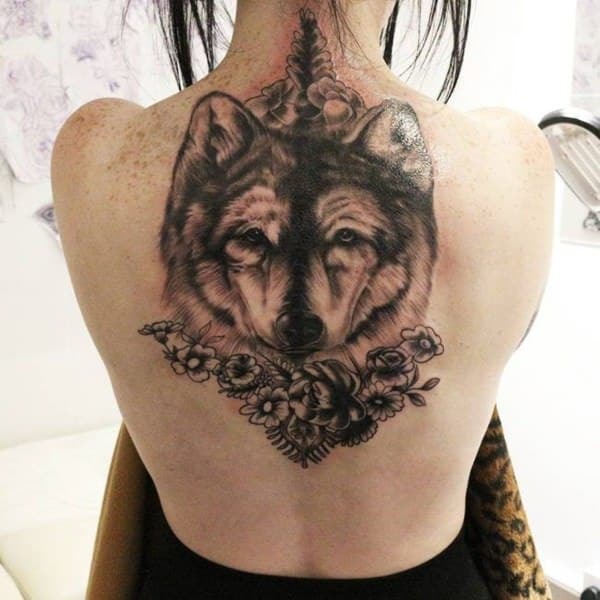 The flowery wolf head represents the tattoo owner’s passion for romance and love. 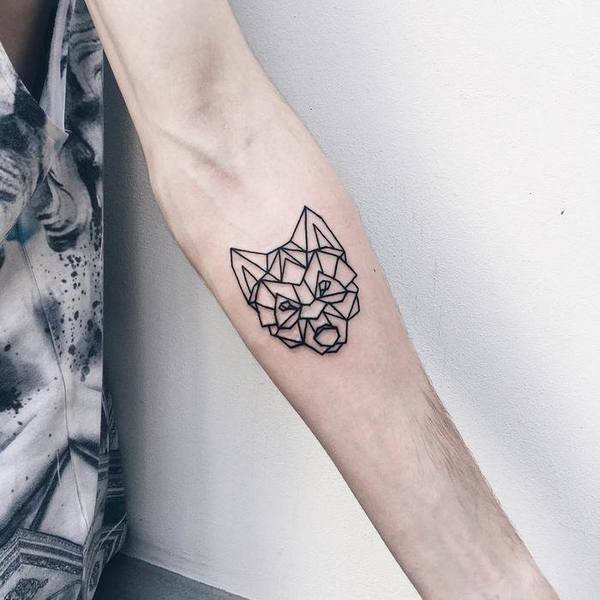 By using simple geometric lines, you too can rock a young wolf tattoo which represents youthfulness and innocence. 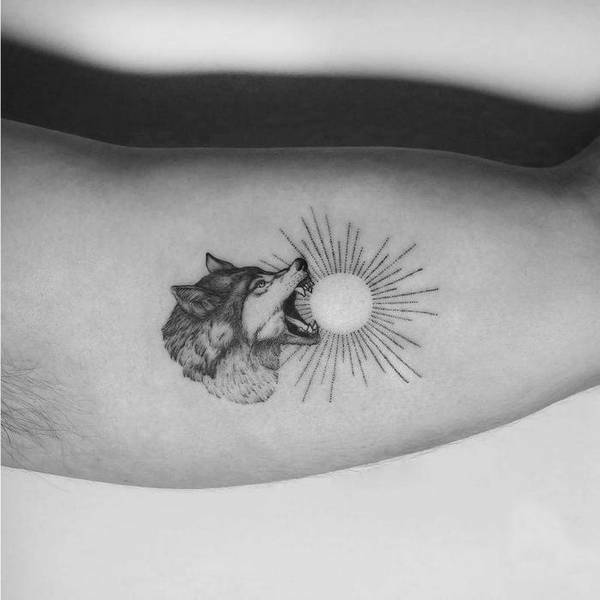 This wolf tattoo is inked in an unconventional manner by drawing a sun-eating wolf which symbolizes the tattooee’s quest towards glory. 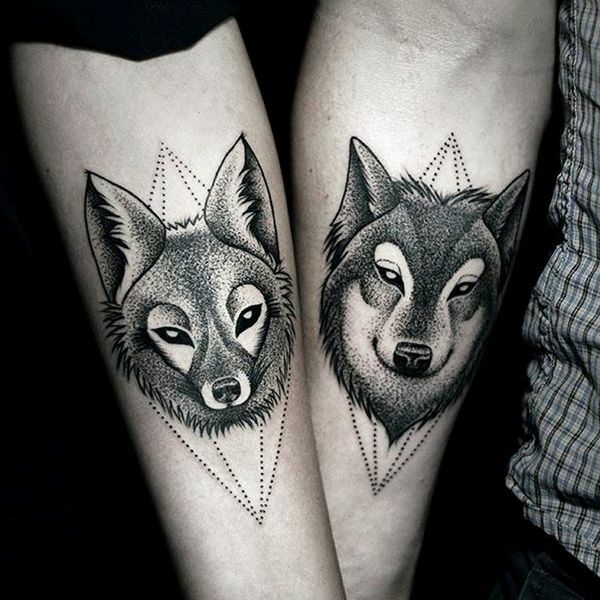 This wolf tattoo calms anyone who views it with its two lovely resting wolf couple. 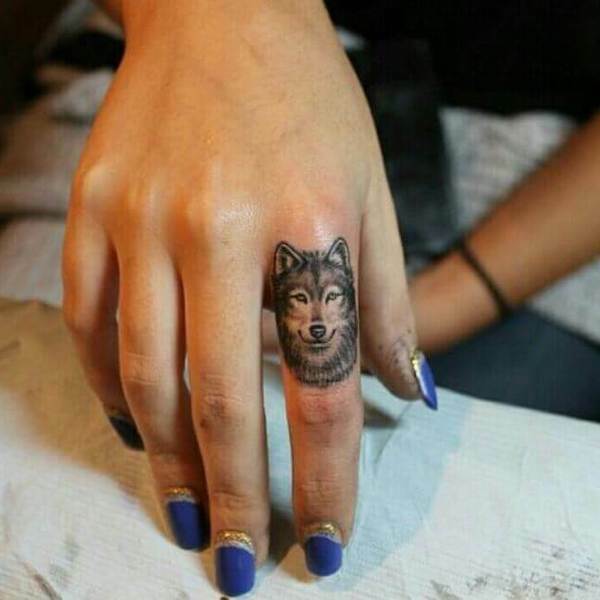 The finger placement of this wolf tattoo makes it very personal because a finger is usually seen as an intimate place to put a tattoo. 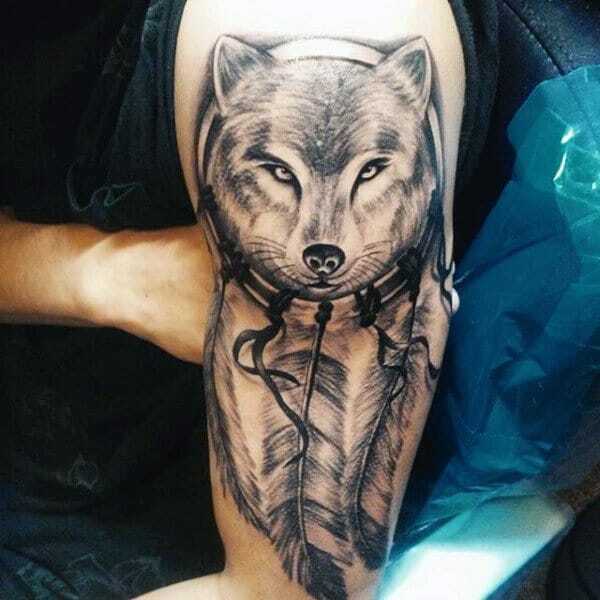 The wolf serves as an essential symbol in Native American culture because of their keen sense of their surroundings making them a popular choice for those who want to pay tribute to their ancestors. 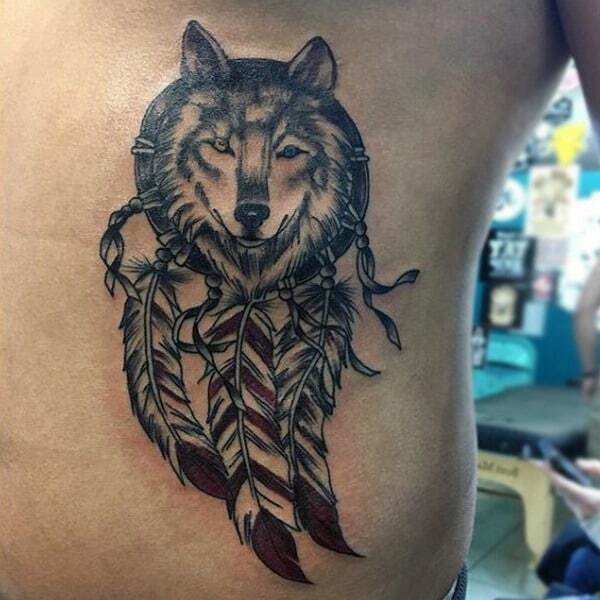 Aside from being used as a tribute, a Native American wolf tattoo can also represent your spirituality and deep connection to nature. 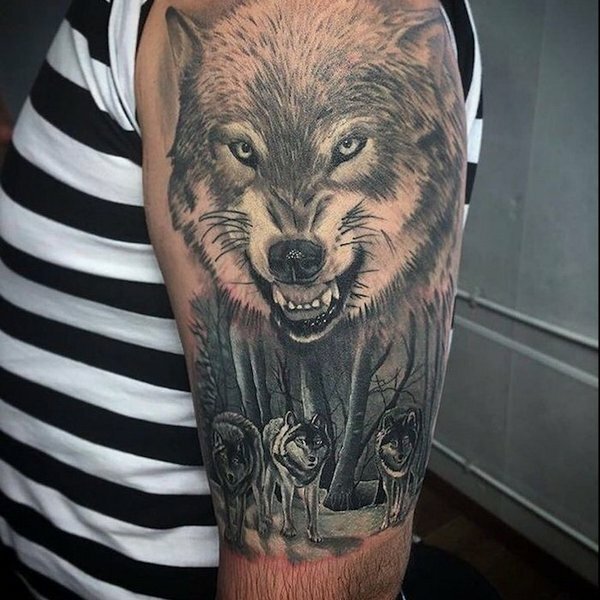 This wolf tattoo represents a very famous Native American folklore in which their ancestors transformed from wolves to men. 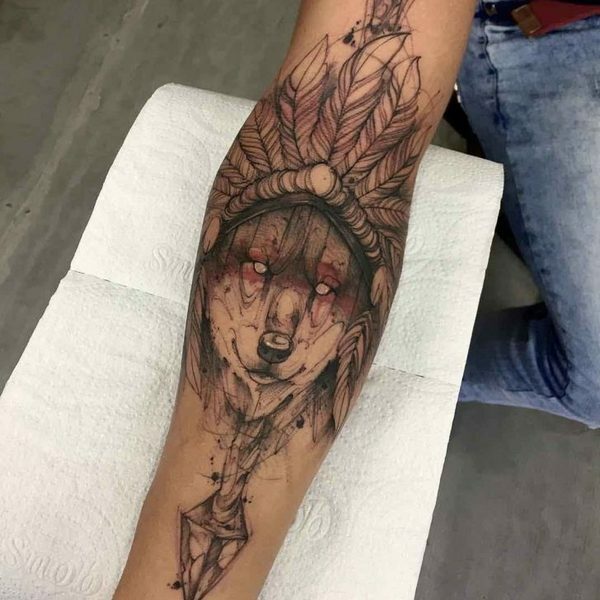 The wolf headdress design symbolizes their influence on Native Americans as spirit guides. 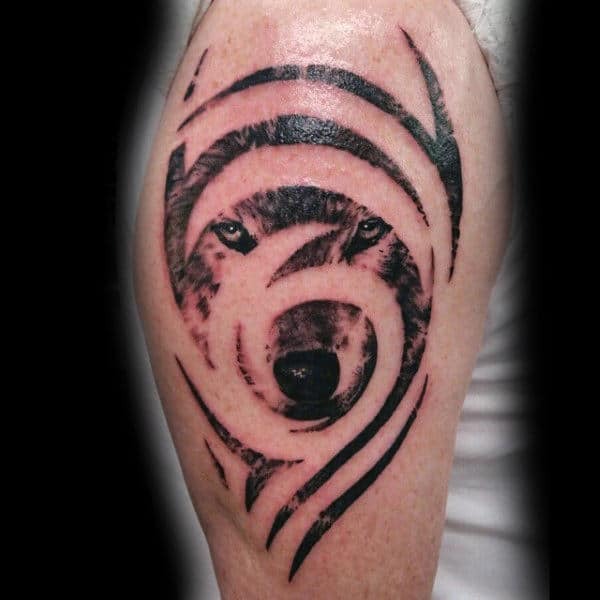 Symbolizing camaraderie between the wolves and Native Americans, this wolf tattoo certainly holds a profound meaning. 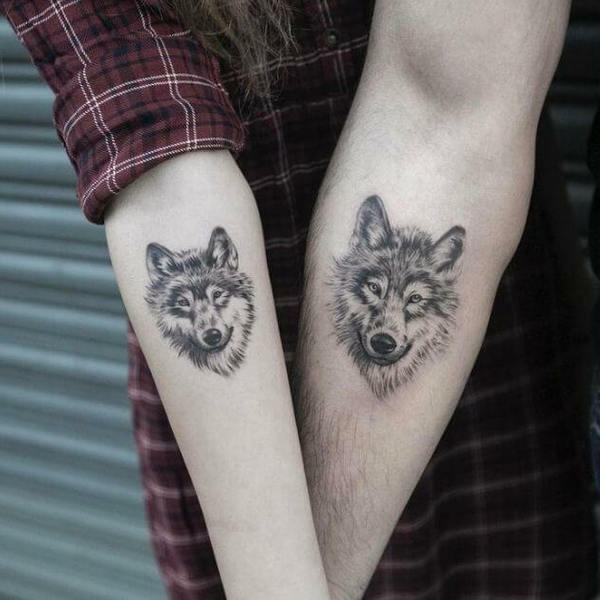 Whether you want to get two wolves inked on you or you want to give the other half of a matching tattoo, a matching wolf tattoo certainly gives its owner a physical representation of their bond with another person. 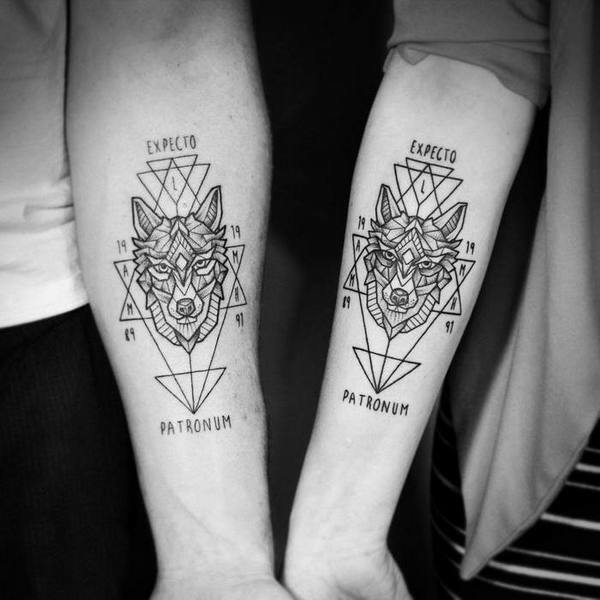 This matching wolf tattoo will capture the minds of all the Potterheads out there! 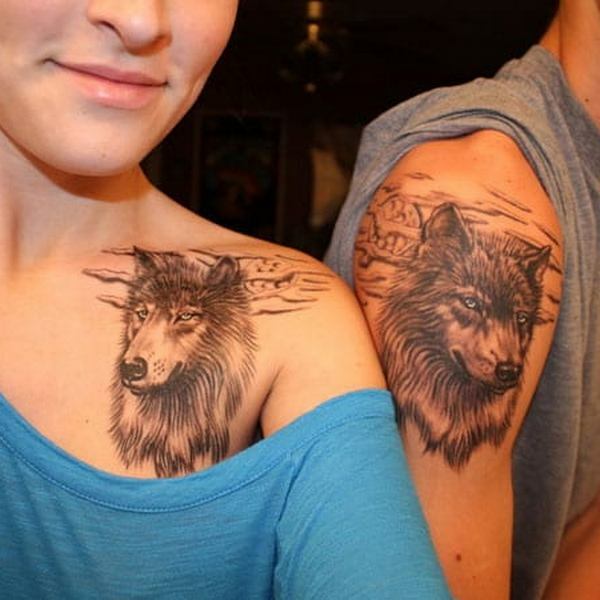 Solidify your relationship by getting a matching wolf tattoo. 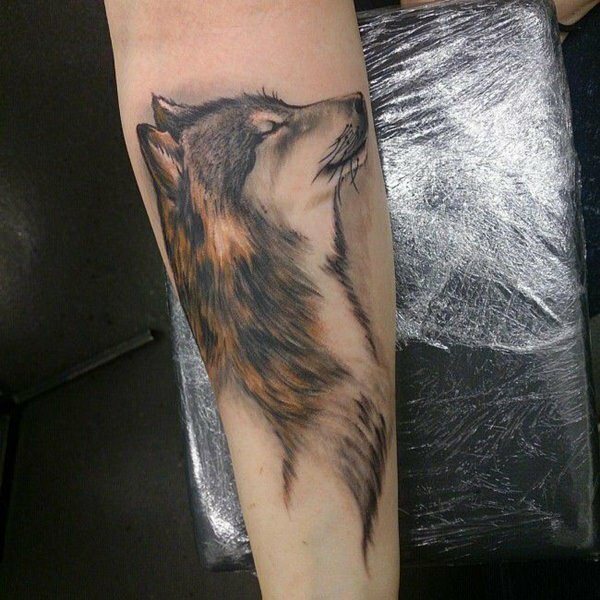 If you are someone who wants to stay classic and wants to approach things more traditionally, then get a realistic wolf tattoo. 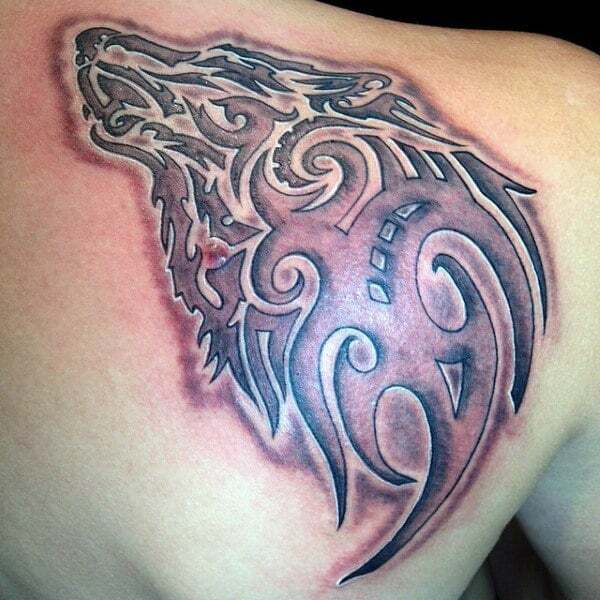 Calm your senses as you stare at this beautiful tattoo which is an excellent extension of the tattooee’s temperament. 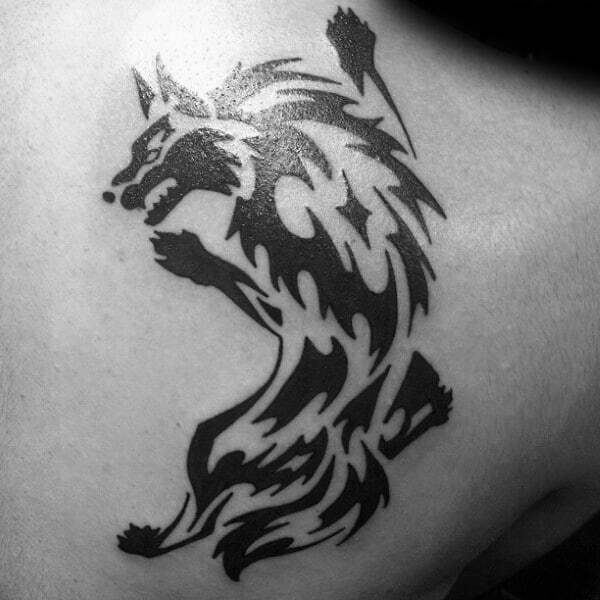 This wolf tattoo represents the tattooee’s lone adventure in life which implies both sadness and strength to move on. 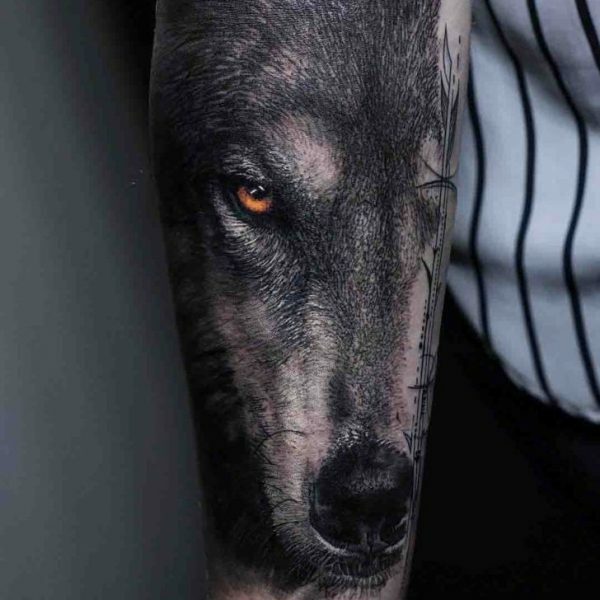 Get goosebumps with this wolf’s cold stare and immediately appreciate this piece of art. 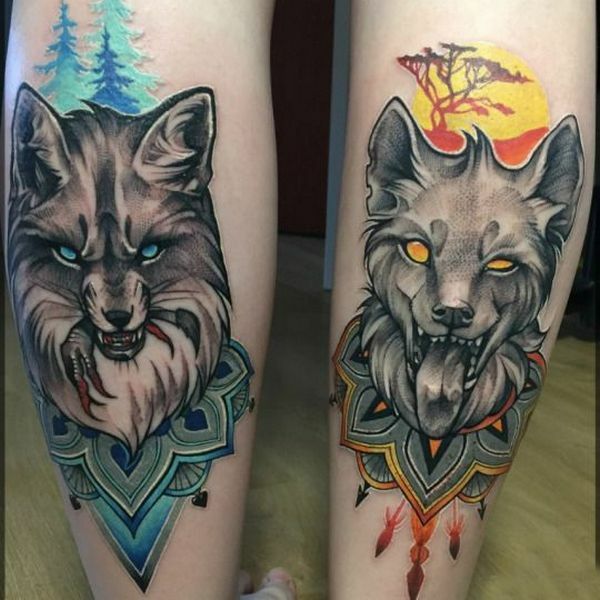 Although wolf tattoos are popular nowadays, there is much allowance for a wolf tattoo to be unique and special because of how it’s perceived differently by many cultures. 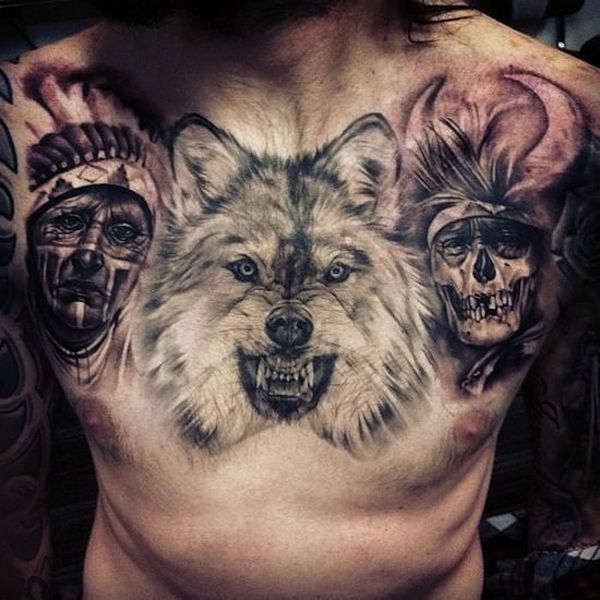 As mentioned above, Native Americans see wolves as a spiritual guide and sign of strength. In other parts of the world, wolves appear as Shinto gods in Japanese culture while in the time of the Celts, wolves were seen as protectors of the woods. 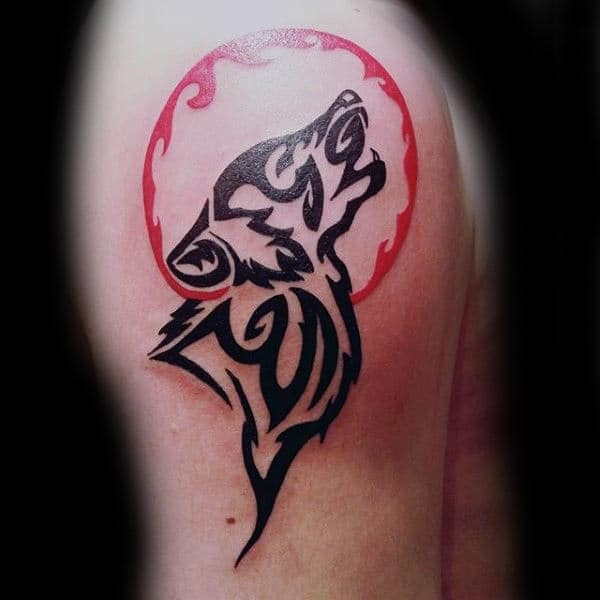 As seen above, wolf tattoos can be interpreted in virtually limitless ways because of its ubiquity in many cultures. 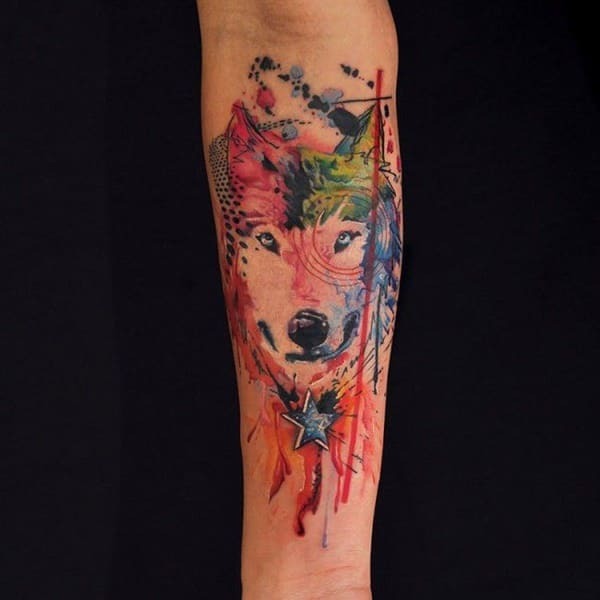 Moreover, a wolf in a tattoo can have different styles and can come with other animals holding a profound significance. 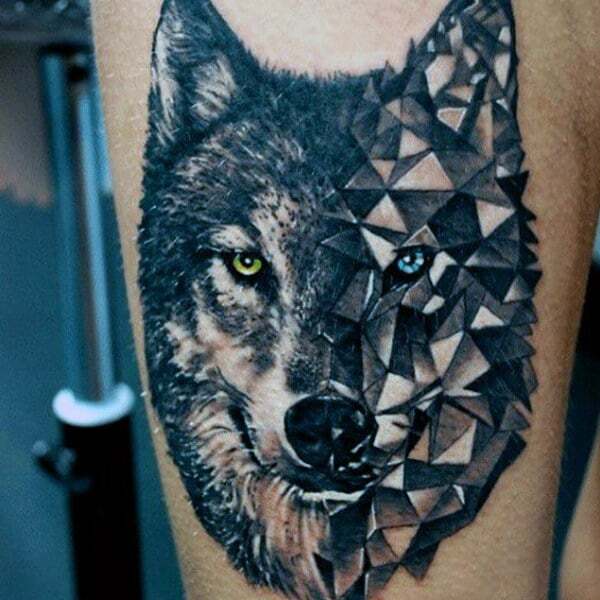 We have gathered the most outstanding wolf tattoos along with their meanings, so hopefully, you can find inspiration for your next wolf tattoo! 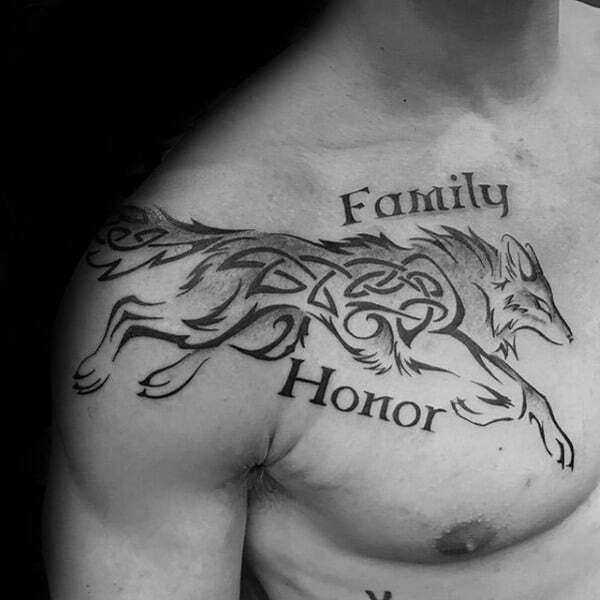 Because of the vast choices and inspirations to choose from, planning for a wolf tattoo is not an easy task. 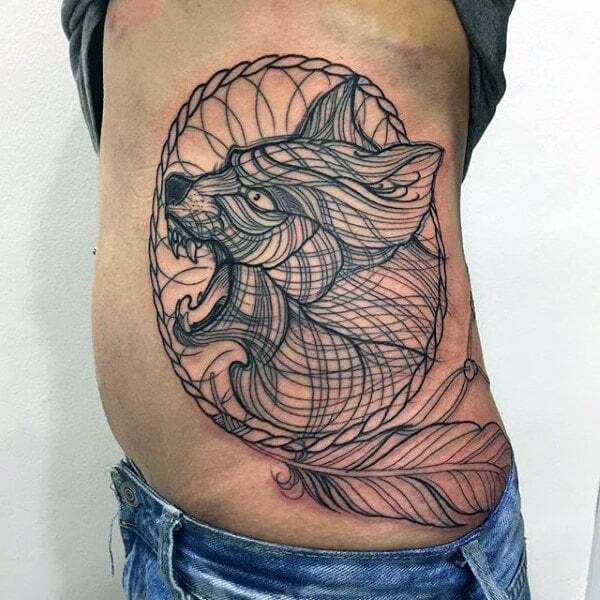 But because of the wolves’ familiarity in many cultures worldwide, careful planning and the right choice of tattoo artist certainly pays off. 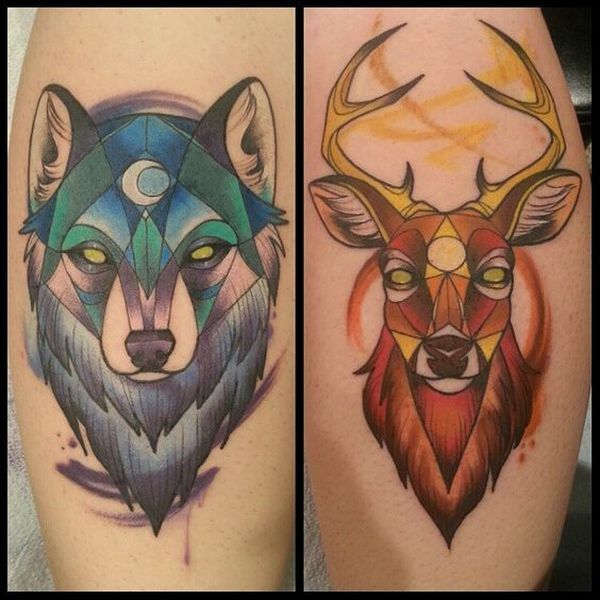 We recommend reading up on other best tattoo inspirations so you won’t regret any decision you make. 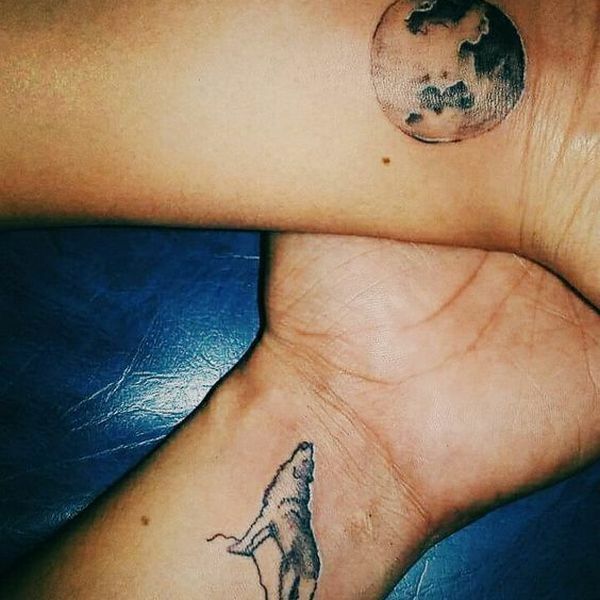 Once you get your new wolf tattoo, you can then share it with us and get a chance to get featured on our next article!